During the summer of 2017, I flew from Los Angeles, California (in the United States) to Umeå, Sweden (in northern Europe) and began cycling to the North Cape in Nordkapp, Norway. 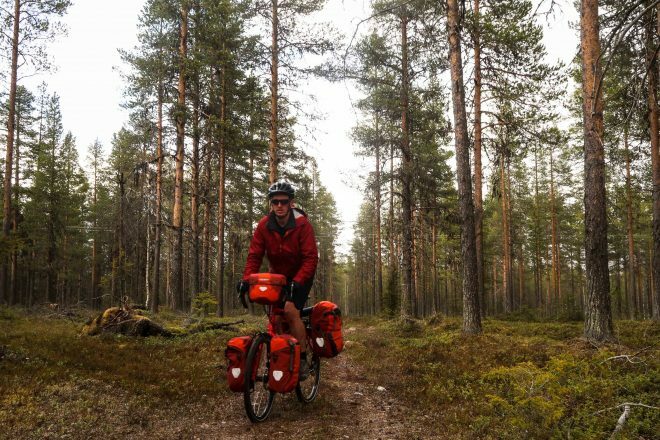 Along the way, I passed through three different Nordic countries (Sweden, Finland and Norway), camped in my tent each and every night of the tour, and pedaled my new Co-Motion Cycles Siskiyou touring bicycle close to 2,000 total kilometers (averaging approximately 85 kilometers each day). 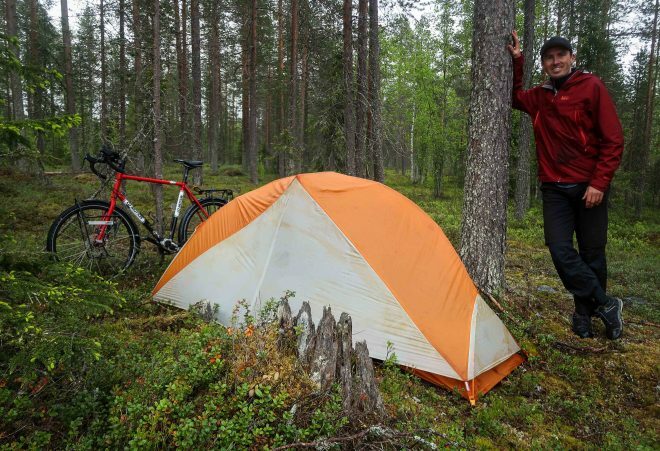 Click here to view and download my cycling route across Sweden, Finland and Norway. 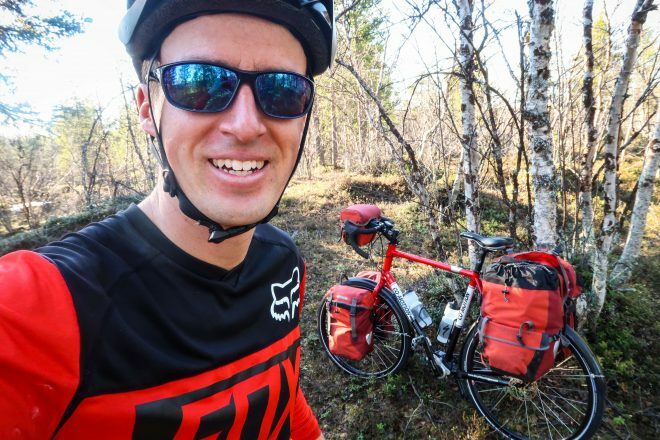 My cycling adventure in northern Europe began with a long flight from Los Angeles, California to Stockholm, Sweden… and then a much shorter flight from Stockholm to the city of Umeå. 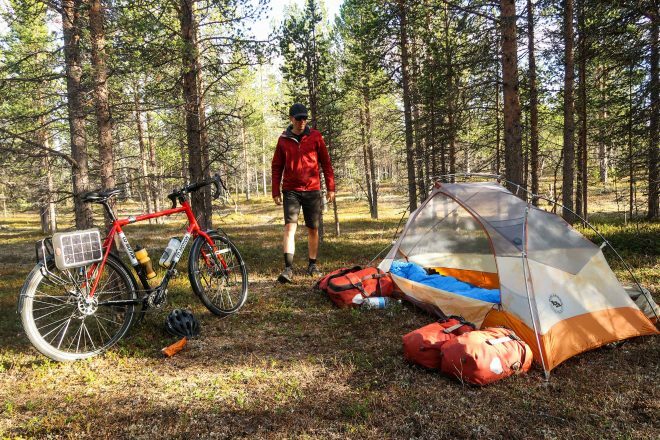 Umeå, Sweden, as you might know (if you’re a long-time follower of Bicycle Touring Pro), has been a focal point on two of my previous European bike tours. 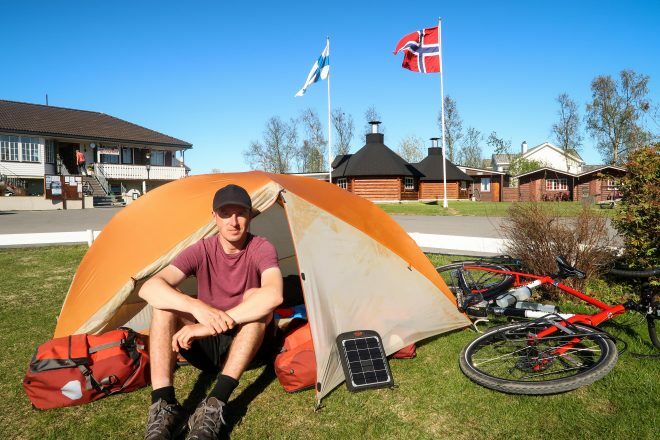 In 2015 I finished a 14-month-long bicycle tour across Europe and Asia in Umeå, Sweden. 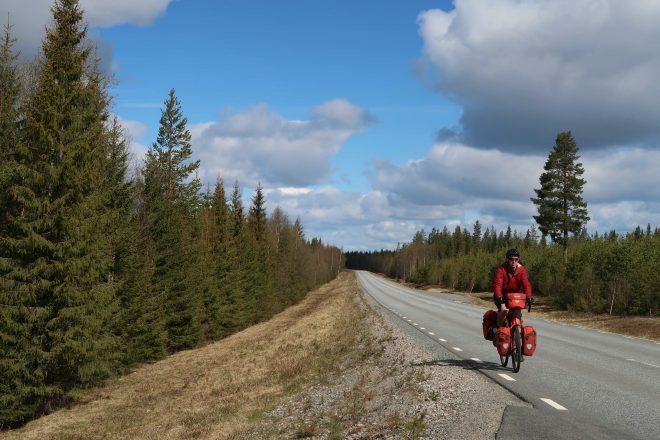 Then, in 2016, I returned to Umeå after completing a much shorter 3-month-long bike tour in Portugal, Spain, France, Andorra, Norway and Sweden. 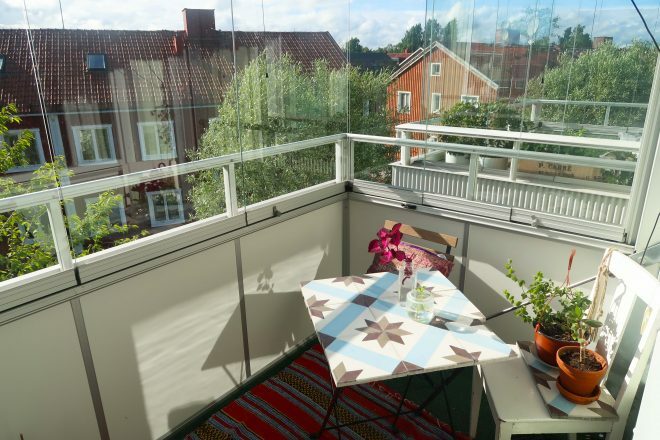 This year, I returned to Umeå for two reasons. 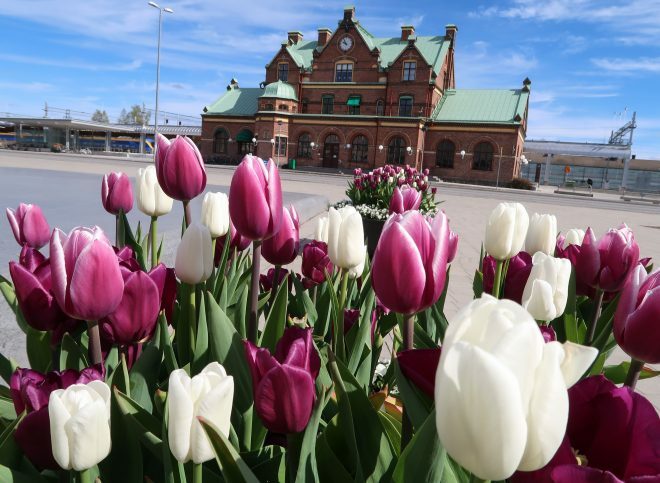 1) I like it in Umeå (It’s one of my favorite places in all of Europe). 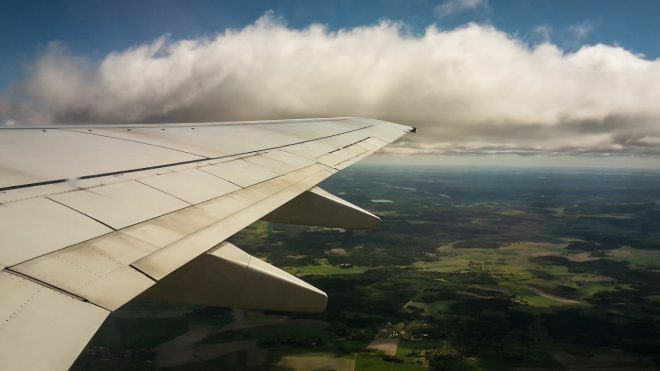 And 2) when I flew back to the United States in 2016 after having completed my summertime bike tour in Europe, I was able to book a relatively inexpensive round-trip ticket back to Umeå at that same time (In other words, a one-way ticket back to Los Angeles was practically the same price as a round-trip ticket to Los Angeles and back to Umeå). So, I booked the round-trip ticket and found myself back in Umeå nearly one year after having been there the previous summer. 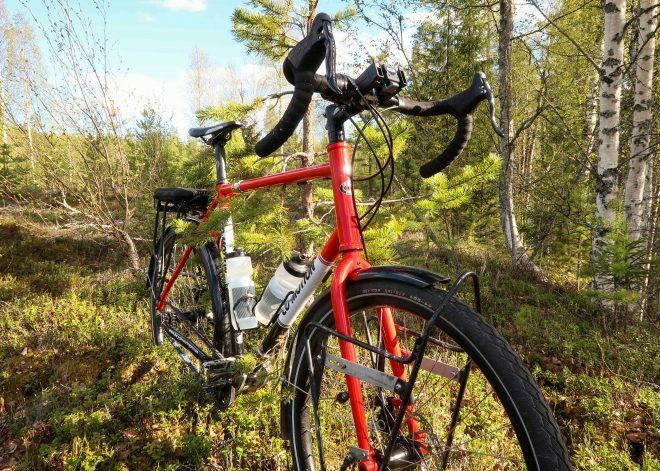 This year, I returned to northern Europe with a brand new bicycle: a Co-Motion Cycles Siskiyou touring bicycle with a Pinion gearbox and the Gates carbon drive system. It’s a very special bicycle and I was super excited to try it out! 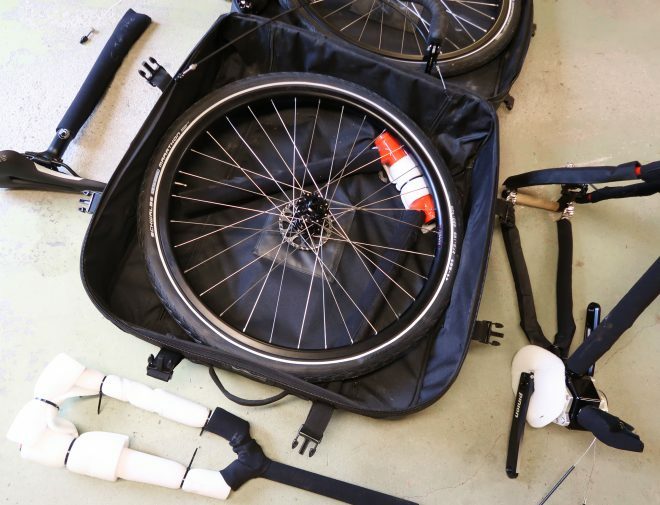 My new bike arrived in California packed inside my Co-Motion Co-Pilot travel case – straight from the Co-Motion factory in Eugene, Oregon just a few days before my bike tour in Europe was about to begin. Rather than unpack the bike at home, then be forced to re-pack the entire bicycle just a few days later in preparation for its flight to Sweden, I simply left my new bicycle packed away inside its travel case and hoped that everything would be there and in good working order once I arrived in Umeå, Sweden. 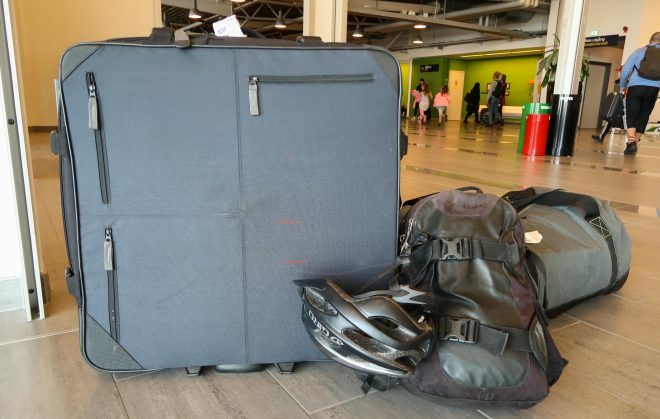 The photo above shows how I flew my new touring bicycle and the rest of my gear, clothing, toiletries, etc to Europe. My Siskiyou touring bicycle is packed away inside the large suitcase you see on the left side of the photo; my computer, camera, helmet, wallet and passport flew with me on the airplane inside that small black backpack; and the rest of my belongings flew as checked baggage inside that gray duffle bag you see hiding in the background on the right-hand side of the image. Luckily, everything arrived in Umeå and appeared to be in good condition. My friend Mats (whom I had met in Umeå the previous summer) was at the airport when I arrived. We loaded my belongings into his car and then he drove me back to his home near the city center. 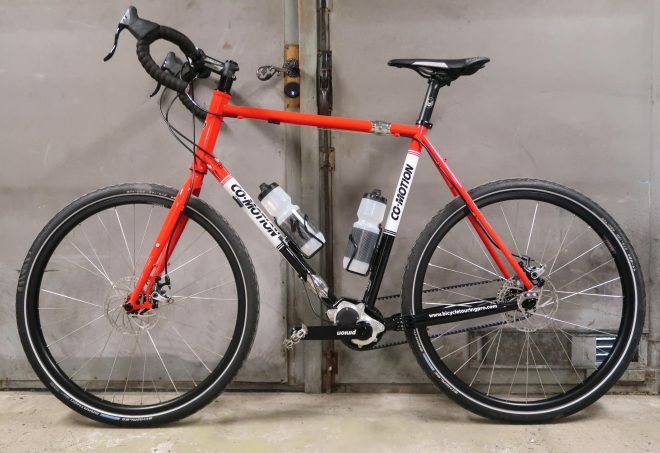 The most important thing I needed to do during my first few days in Sweden was to 1) recover from jet-lag and 2) assemble my bicycle and get it ready for it’s month-long cycling adventure to the North Cape in northern Norway. Co-Motion had packaged the bicycle up inside their Co-Motion Co-Pilot travel case, so my only task was to remove the bike from its case and put it all back together. This, however, is easier said than done – especially with a brand new bicycle. Assembling my new touring bicycle took several hours. Of course, the process was made even longer due to the fact that I was taking photos and shooting videos of the entire process. After several hours of careful and steady work, however, the bike was nearly complete! 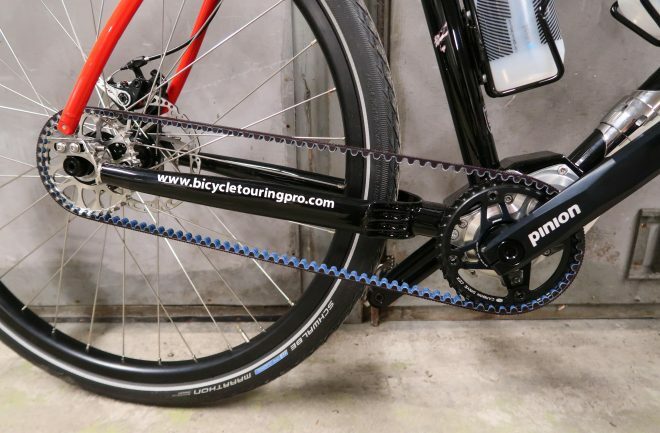 One of the biggest differences between this new Co-Motion Cycles Siskiyou touring bicycle and my older Co-Motion Cycles Pangea touring bicycle is the addition of the Pinion gearbox and the Gates carbon drive system (which you can see in the photo above). Now, instead of the traditional metal chain and derailleur system, my new Siskiyou bicycle is driven by a belt and an internal gearbox that is built into the bottom bracket of my bicycle’s frame. With the bicycle fulyl assembled, I stopped to take a few photos of the bike, the gearbox, the belt, and me standing next to my new bike. Afterward, I continued the bike build by mounting the fenders, front and rear racks, and my Blackburn bike computer. It took me nearby a whole day to get the bike together, shoot all these photos, and produce the video I would need to later show the process of the bike coming together. Luckily, Mats has a nice big garage for me to work in, and that made the assembly process a whole lot easier. 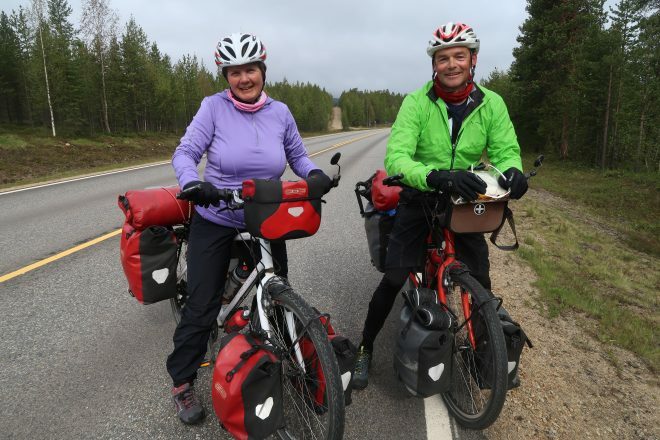 I had planned to leave Mats’ home and begin cycling north after only 1.5 days in Umeå, Sweden, but I was suffering from some serious jet-lag and was fearful about hitting the road so soon because I was so incredibly fatigued. Thankfully, Mats and his wife Eva invited me to stay for one more night and allowed me to participate in their family’s Mother’s Day dinner. At the dinner, I was introduce to Pontus (Mats’ son), Linda (Eva’s daughter) and Frederick (Linda’s boyfriend). 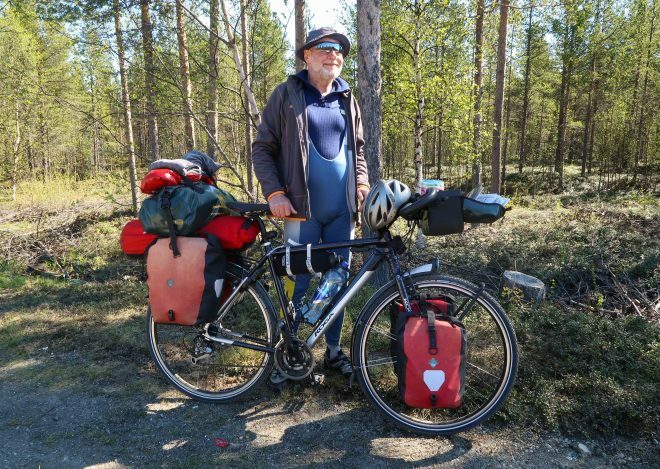 Then, after three nights in Mats’ and Eva’s home, I packed up my bicycle and said goodbye. 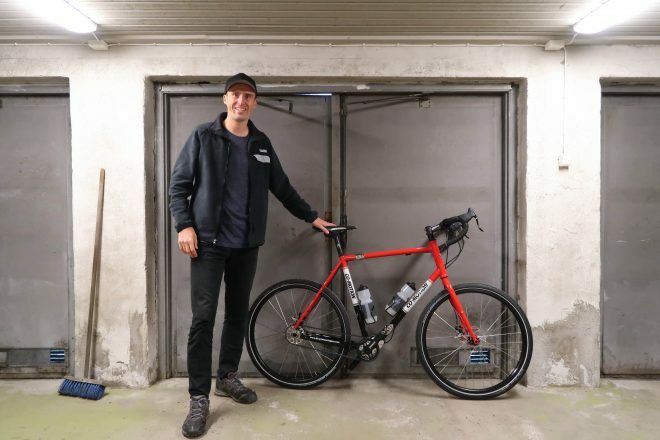 Leaving town, I rode past the city’s iconic train station, cycled through the tunnel, and then exited on the road that would take me for the first hundred kilometers or so toward the Nordkapp in northern Norway. The road leading out of Umeå began by passing through what I would classify as farmland. There were little red and yellow houses scattered among fields and forests. 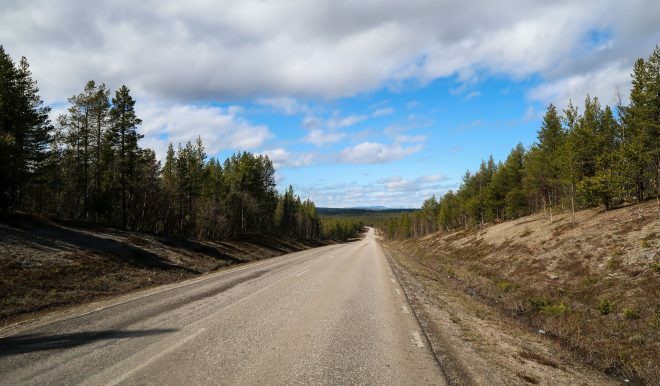 But the further out of town I cycled, the more the road began to transform into the endless forest landscape Sweden (and Finland too) are most known for. 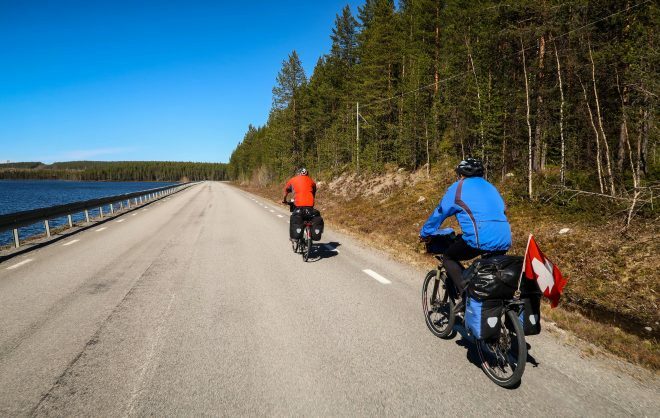 If you want to know what it’s like to ride a bicycle across Sweden, just imagine the road below stretching for hundreds and hundreds of kilometers – with an occasional lake, river or pond along the way. 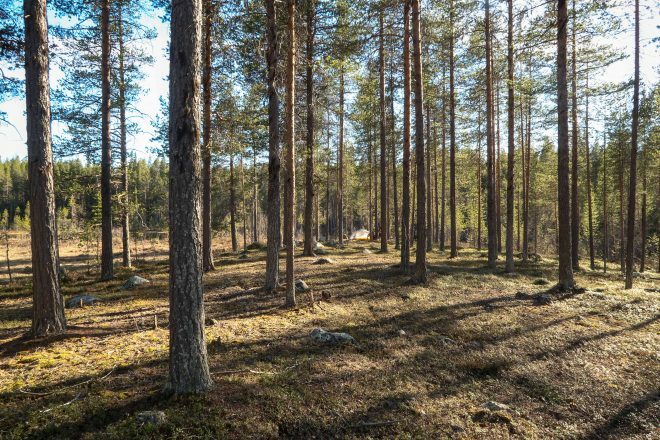 The vastness of the Swedish forests is absolutely stunning… and while some might find this never-ending green and brown forest to be boring after a while, I found it to be both beautiful and relaxing. During my bike tour to the North Cape in Nordkapp, Norway, I spent most of my days cycling on perfectly paved roads like the one you see above. There was rarely a big shoulder to cycle in, but that didn’t matter much, because there were so few cars on the road. 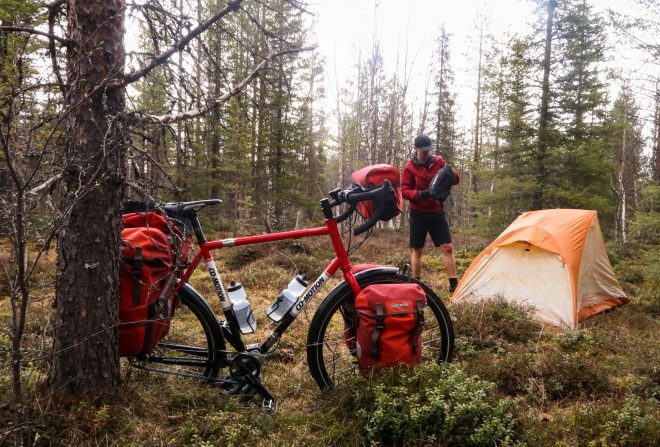 In the evening, however, when it was time to start looking for a place to camp for the night, I’d look for a dirt road to turn off on and then I’d cycle down that road for a while – looking for a place in the forest where I might be able to camp. 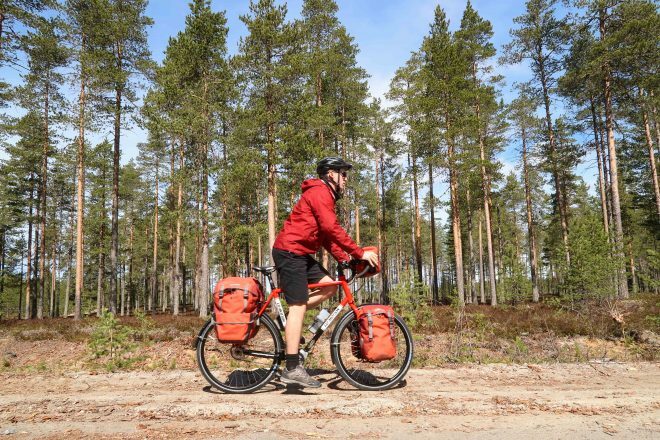 One of the many great things about bicycle touring in Sweden, Finland and Norway is that all three countries have what is called “Alle Mans Rätt” or the “Freedom to Roam.” This regulation basically states that you, as a traveler, have free access to the wilderness, as long as you tread lightly and don’t do damage to the natural environment. 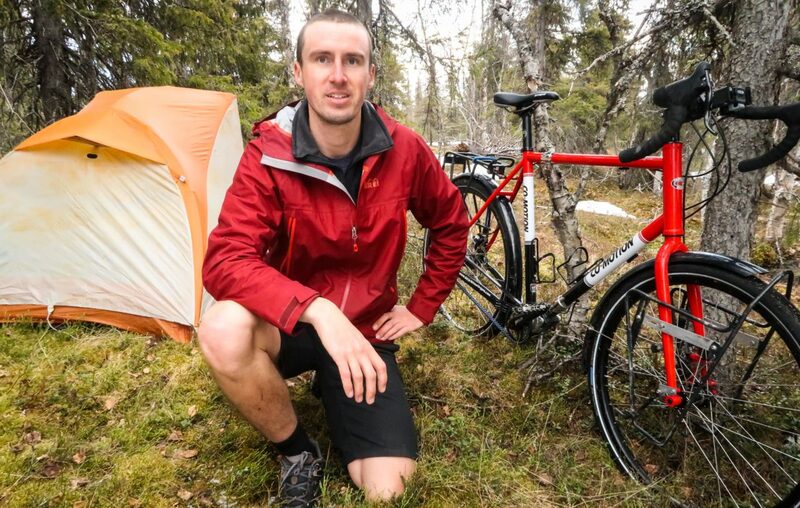 With this in mind, I was able to camp in the forest each and every night of my bike tour, without having to pay even a single cent… and without having to worry that I was on private land or doing something that could potentially be illegal. 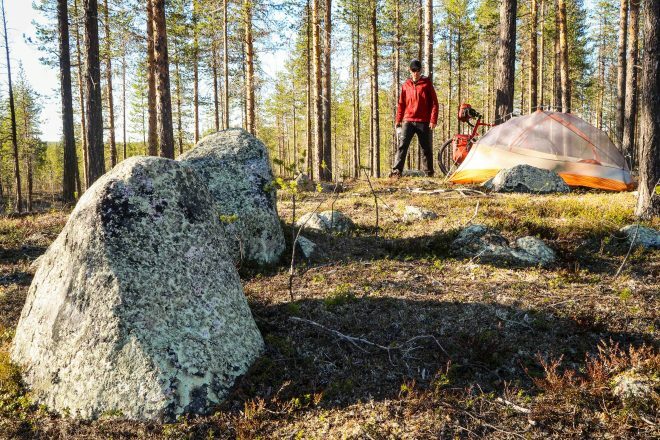 Because of the Alle Mans Rätt, camping in Sweden, Finland and Norway is an absolute joy! During the first day of my bike tour I only cycled a short distance over 60 kilometers. I was still very much recovering from jet-lag and by the time 6:00 PM rolled around, I was beyond fatigued. 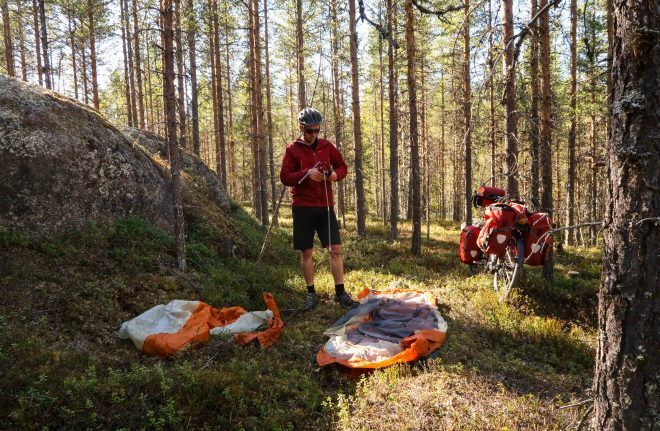 I pushed my bike a short distance off the road and found a flat, isolated spot above a passing river where I could pitch my tent. 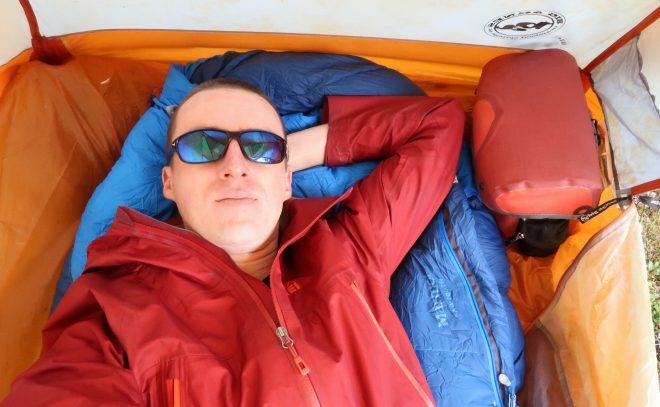 Once the tent was up, I crawled inside, removed my shoes, took in the view of the river below for just a moment or two, then laid my head down on my sleeping pad/bag and instantly fell asleep. I woke up around midnight and was shocked to see that the sun was still out. I crawled out of the tent and relieved myself by a nearby tree, then crawled back into my sleeping bag and rested for several more hours. In the morning I packed up my bicycle, pushed my heavy vehicle back out to the road, and began cycling north. I knew that if I was going to reach the North Cape in time, I was going to need to cycle much more than 60 kilometers per day. 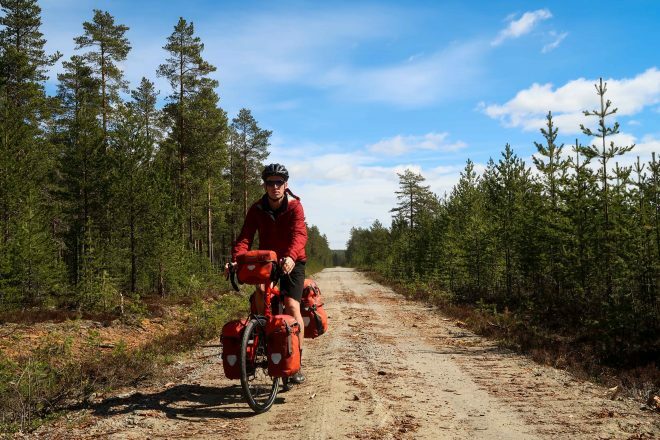 In fact, I’d need to cycle closer to 100 kilometers per day if I planned to cycle to the Nordkapp and then back to Umeå, Sweden in the amount of time I had allotted for this particular bike tour. 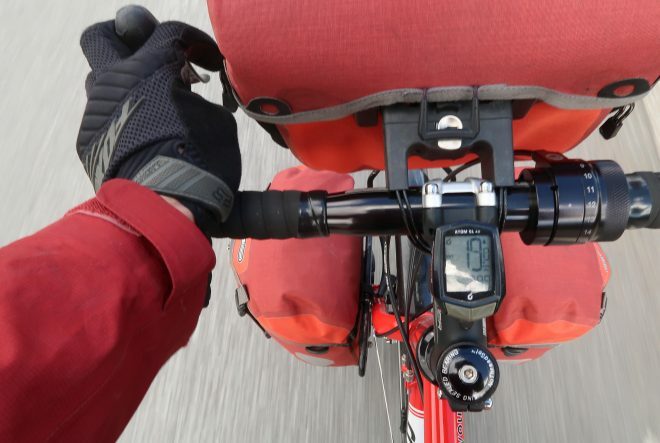 So, during the second day of my bike tour to the North Cape in northern Norway, I pretty much just put my head down and pedaled – stopping only occasionally to take photos/video and adjust my bicycle’s saddle (which took me several days to get into a correct and comfortable position). At the end of the day, I found a beautiful little forest campsite near a a cluster of large boulders located just a short distance from a small lake. By this point in my travels, I was starting to feel a lot better (I wasn’t as jet-lagged as I had been previously) and I started to settle in to my new reality. The forest was going to be my home for the next month… and if every day was a nice as this day had been, the rest of my bike tour would be an absolute delight. Even though I was still below the Arctic Circle at this point in my tour, the sun never really stopped shinning at night. So getting used to the long nights took a little doing. I’d go to sleep and it would still be light out; I’d wake up in the middle of the night and it would still be light out; and when I’d wake up in the morning, it would still be light. 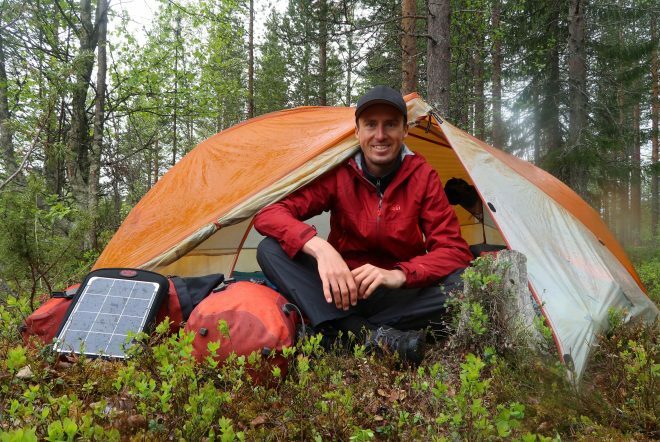 I started sleeping with my bike computer inside my tent, so I could quickly and easily reach up and tell them time – without having to turn on my smartphone. 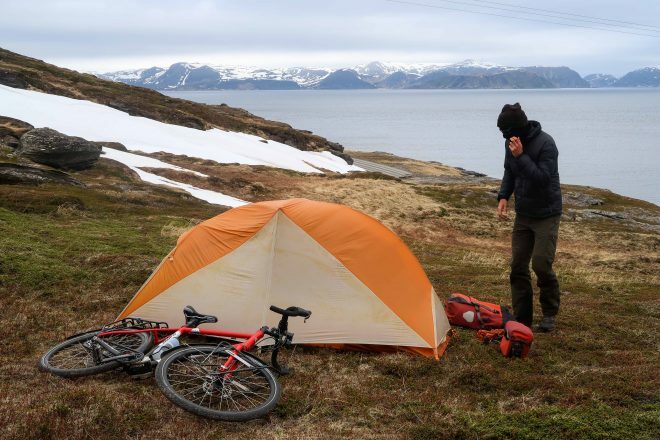 After a long night’s rest, I packed up my bike, and began cycling on what would be the third day of my bike tour to the Nordkapp and back. I didn’t do a lot of planning for this particular bike tour. I knew the general route I wanted to take, but I also knew that I was open to other ideas and suggestions. In fact, reaching the North Cape (or the Nordkapp – same thing) was really just a destination for me to reach. Whether I actually reached the North Cape or not, I didn’t really care. My main goal was to just be out in nature, explore, take photos, shoot videos, and have fun! So, when Mats (back in Umeå, Sweden) suggested I take one road instead of another road I had originally planned on cycling, I decided to follow his advice. 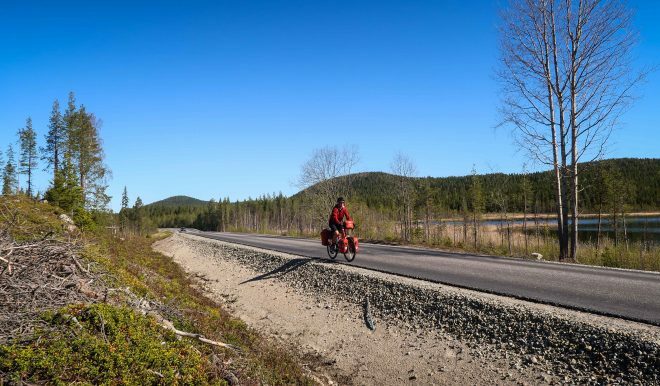 Little did I know at the time, but this road that Mats suggested to me was the same road that I had cycled last year during the last few days of my Bodo, Norway to Umeå, Sweden bike tour. 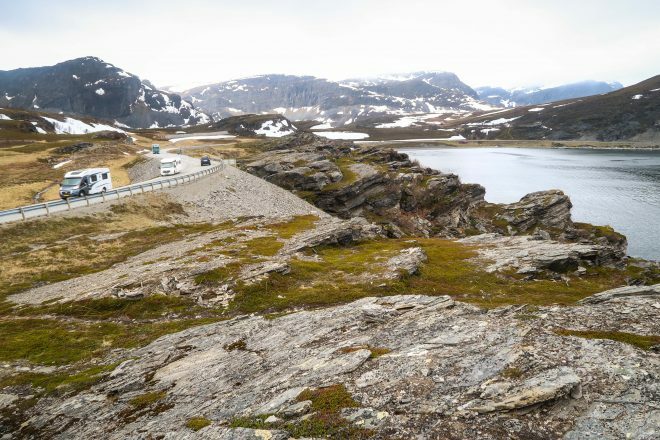 So, the road that transported me from Bodo to Umeå last summer became the road that would transport me in the other direction for the first three days of this Nordkapp bike tour. Cycling on this familiar road meant that there were several points along the route that I knew and recognized. 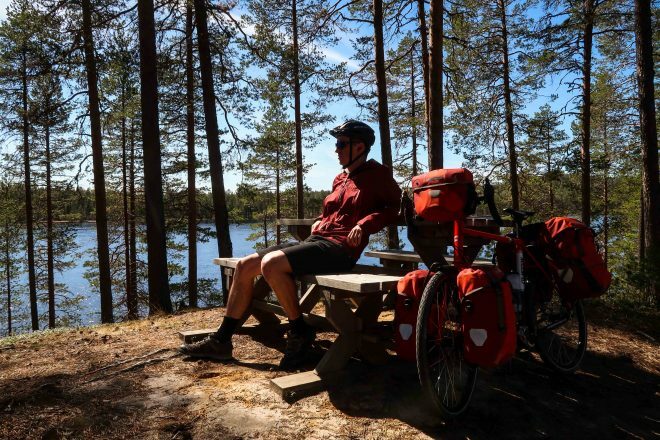 This picnic table (pictured above) is just one of the many places I stopped and shot video during my 2016 bike tour in Sweden. 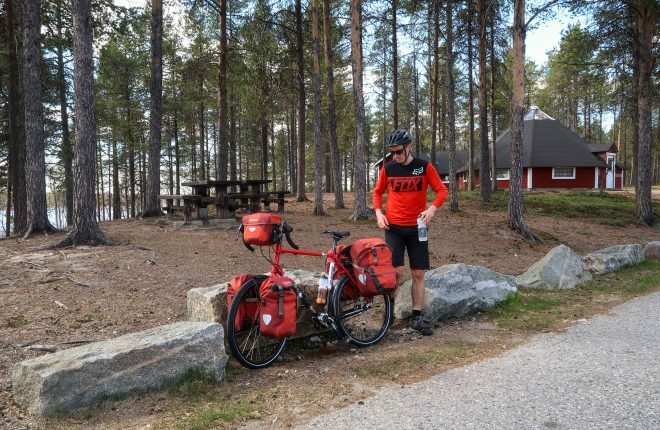 Only when I reached the city of Malå, Sweden did my bike tour to the Nordkapp begin to look brand new. Everything prior to that was simply a repeat of what I had experienced during my bike tour last summer. Of course, when I reached Malå, Sweden, the weather had turned from bright and sunny (yet still very cold) to dark and snowing! This, you might realize, was the worst possible moment for the weather to take a turn for the worse. Just as I was about to take off into the unknown, the wind was blowing, the snow was falling and I was freezing cold. On top of all that, I was still more than 800 kilometers from the North Cape! If the weather was so bad this far south, I feared the weather up above the Arctic Circle would be countless measures worse. It took me several days on the road to really get into the swing of things. I was cycling against a small headwind pretty much the entire way to the Nordkapp, so that slowed me down a bit as well. But once I found shelter behind a hillside or a gathering of trees, I’d be able to shift into a higher gear and really gather some speed. Days when the sun was out made my time on the road even better. But despite it being sunny, it was still very, very cold. I wore shorts on almost every day of the bike tour, but most of the other cyclists I encountered on the road were wearing long pants. This friendly woman from Sweden (I think her name was Monica) was the first long-distance cyclist I encountered on my way to the Nordkapp. She was traveling alone and this was the first time she had ever done a bike tour before. 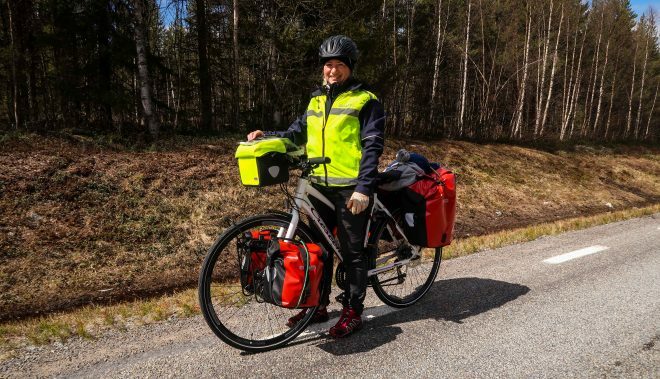 She was cycling from the Nordkapp back to her home in southern Sweden. She said she was enjoying the experience, but that it was cold, and that she had encountered some very cold days at the start of her tour. 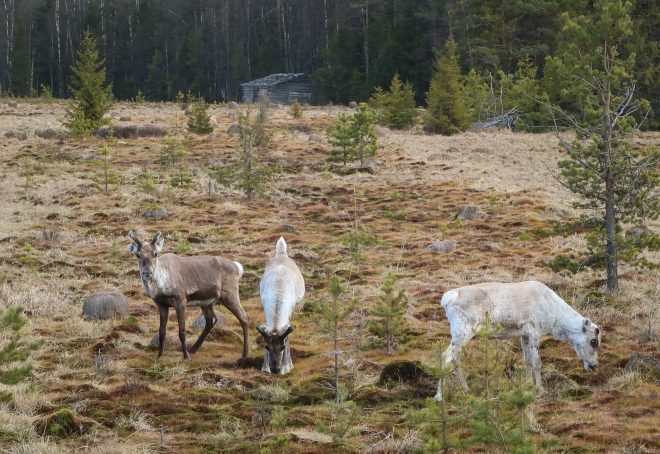 Now well and good into the center of Sweden, reindeer began to pop up all over the place. 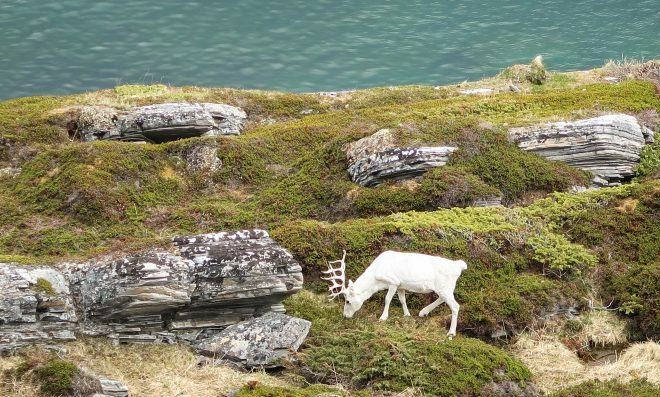 Most of the time the reindeer would appear in a small group, but sometimes there would be just a single reindeer wandering around by itself and feeding in the grass. After a cold and windy day of cycling north of Malå, Sweden, I cycled down a dirt road just a few kilometers outside of city of Arvidsjaur. 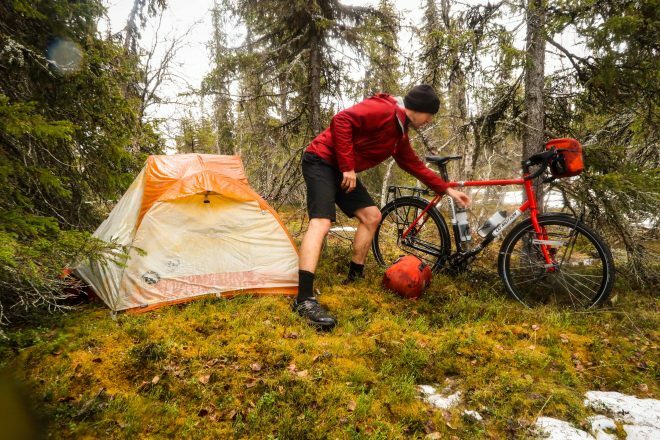 I then pushed my bicycle back from the road a bit and began setting up camp in a flat, moss-covered forest. Just as I got settled in, the snow began to fall. 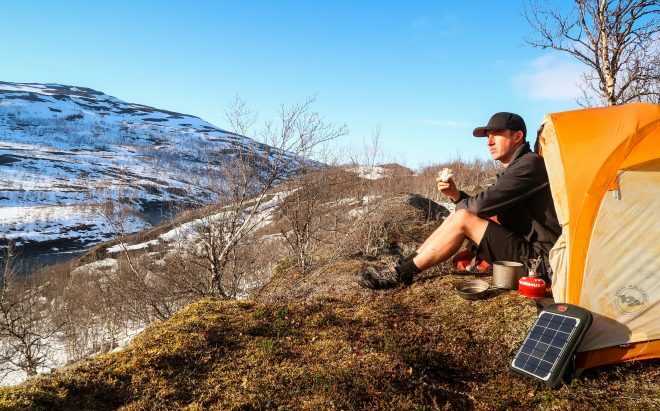 As I sat inside my tent and prepared my dinner on the MSR PocketRocket camp stove I was carrying with me, I realized just how happy I was to be out there on the road. For many people, snow falling on them might feel like a time to panic. But in that instant, I felt at home and was happy to see the snow. A decent amount of snow fell to the ground while I was cooking my dinner, but it wasn’t enough for me to really get worried about. 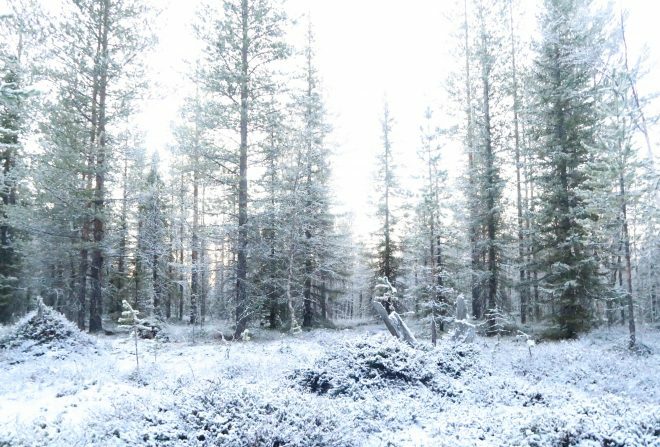 When I woke the following morning, however, everything outside my tent was covered in white powder. 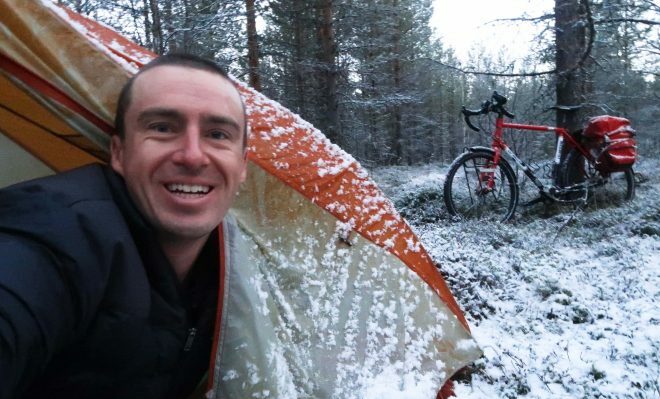 It had snowed for several hours and the entire landscape (my tent and bicycle included) were now covered in at least two inches of snow. 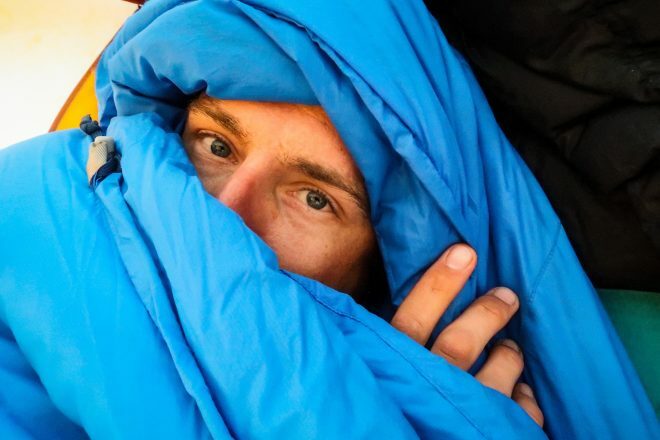 The photo below shows me popping my head out of my tent in the early morning hours, just moments after discovering that it had been snowing while I slept. I stayed inside my tent until nearly noon the following day, and by that time, the snow that had fallen the night before had nearly all but melted. Not wanting to go anywhere really, but knowing I needed to press forward, I crawled outside of my tent, packed up my bicycle, and hit the road! It was only a short 10 kilometers or so into the city center of Arvidsjaur, Sweden, but by the time I got there the wind was blowing and I was freezing cold. I spotted a small Frasses fast food restaurant and jumped inside to get warm. While I was there, I ordered a veggie burger and french fries. 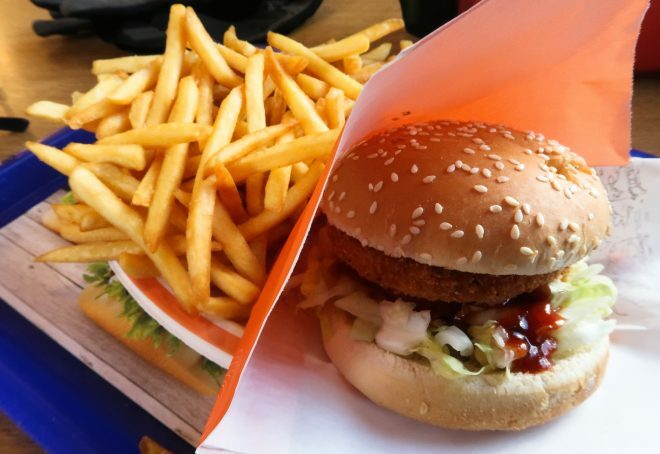 It was the worst veggie burger I have ever eaten! The ketchup was watered down and it was a terrible, terrible meal. I don’t normally eat this type of food during my regular life, but eating this one veggie burger in Arvidsjaur made me consider never eating fast food ever again. After eating and charging my camera/smartphone batteries in town, I cycled just a short distance north of town and almost immediately jumped into a nearby patch of woods. I only cycled about 30 kilometers on this particular day, but I had at least made some forward progress. I got my camera batteries charged (which is very important to me) and I had kept warm for most of the day. So, even though I hadn’t moved very much, I had moved in the right direction. I ended up finding a nice, quiet dirt road, down which I cycled for about one kilometer. 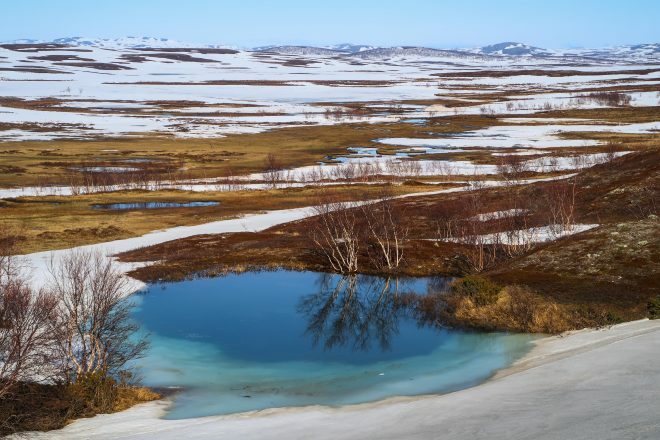 On the left-hand side of the road was a small hill that dipped down to a tiny snow-covered pond. About 50 meters from the edge of the pond was a secluded flat spot, and that’s where I pitched my tent for the night. I was able to fish some water from the pond, which I then used to cook up some pasta for my dinner that night. The following morning, I woke up, packed up my bicycle, and hit the road. My goal was to cover some serious ground… and I ended up cycling a respectable 75 kilometers on this particular day. As I cycled, I laughed to myself as I tried to pronounce the names of these stunningly long Swedish cities, rivers and places. The sign above shows one such name. Just try and say that to yourself right now! (The word on the top is the name of a river (I think) written in Swedish. 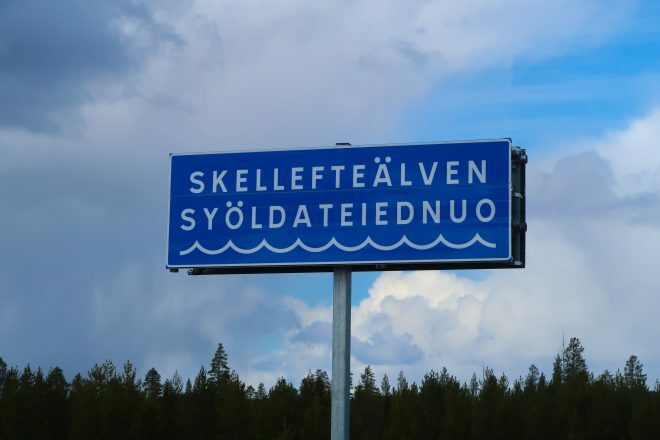 The word underneath it is the name of the same river written in the Sami language – the language of the indigenous people of Scandinavia). At some point on this particular day, I stopped to take a photo of me on my bicycle. When I stopped, I set my camera on the tripod I was carrying with me, set the 10-second timer, and then sprinted back toward my bicycle in order to get into position for the photo. 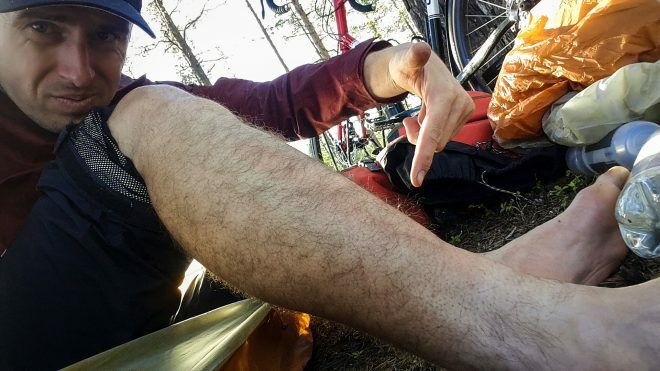 But as soon as I began to run back towards my bicycle, I tripped over one of the legs on my tripod and fell to the ground, slamming my right shin directly into a large exposed rock. I feared at first that I might have broken a bone – it hurt that bad! But when I looked at the sight of the wound, I couldn’t see a thing! I was wearing my rain pants at the time, so the pants had prevented my skin from being punctured during the fall. But I could tell that I had done some serious damage to my leg, and as I continued to cycle that day, the pain only got worse. After a good solid day of cycling, I made camp again in the forest. 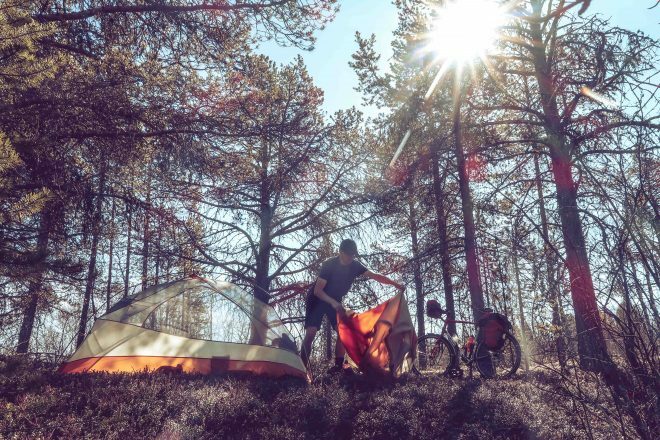 Day after day, this became my pattern: I would wake up, pack up my things, cycle for 3-7 hours, and then make camp in the forest. I’d eat, read or listen to podcasts on my smartphone, and then go to sleep. Only to repeat the pattern the following day. 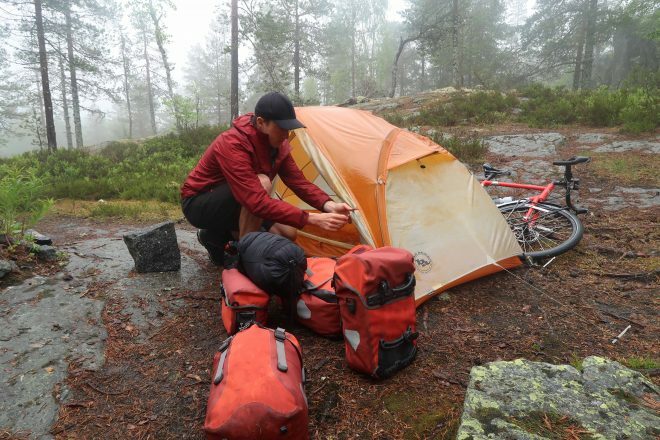 The hardest part of my bike tour to the Nordkapp was simply getting out of my sleeping bag in the morning. It was cold on every single night of the tour (except for maybe two or three nights), so that made getting up and going that much more difficult. Most of the time, I’d wake up, see that the sun was shining, reach for my bike computer to check the time, and then moan as I realized it was time to get up, pack up, and get going. 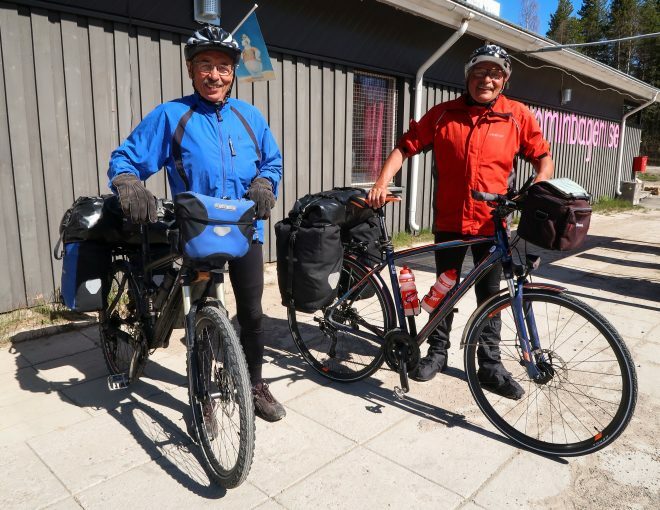 In the tiny town of Kabdallis, Sweden I stopped at a gas station to buy some food and water, and while I was there I was surprised to see two gentlemen traveling with bicycles. 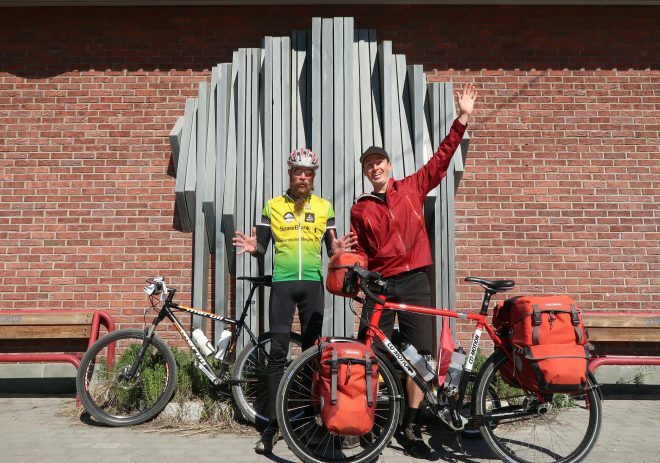 The two men were named Teo and Sepp and they were brothers conducting a long-distance bike tour from their home in Switzerland to the Nordkapp in northern Norway. I cycled with Teo and Sepp for much of the day, and despite the two men being about twice my age, they were difficult for me to keep up with. They informed me that they had woken up at 4:00 AM on this particular morning and were pumping out more than 100 kilometers each day. They certainly made me feel like a wimp! 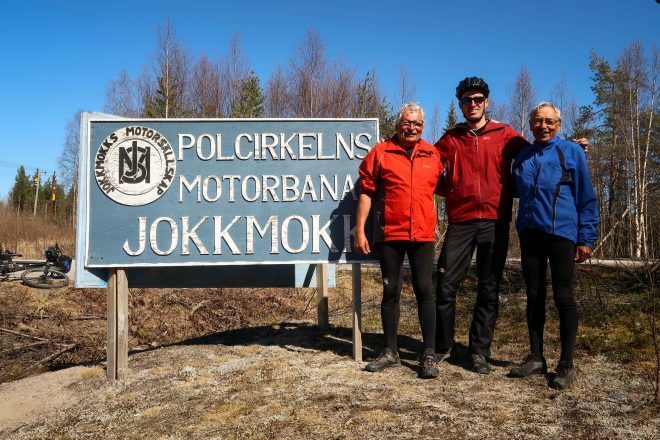 After a full day on the bikes, Teo and Sepp and I reached the sign marking the fact that we were now crossing into the Arctic Circle. 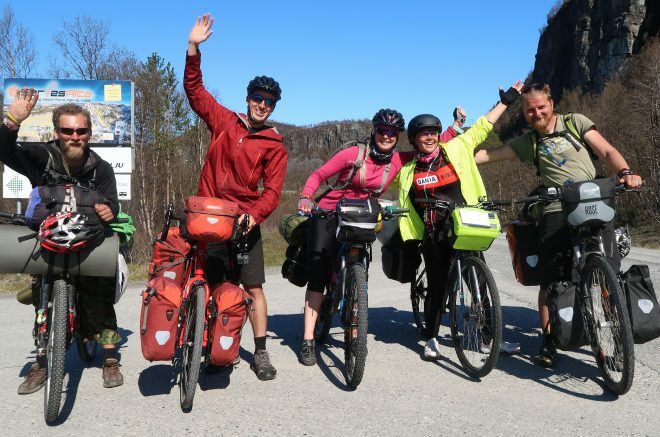 We stopped to take a photo, gave each-other a little high-five, and then continued just a short distance up the road into the city of JokkMokk. 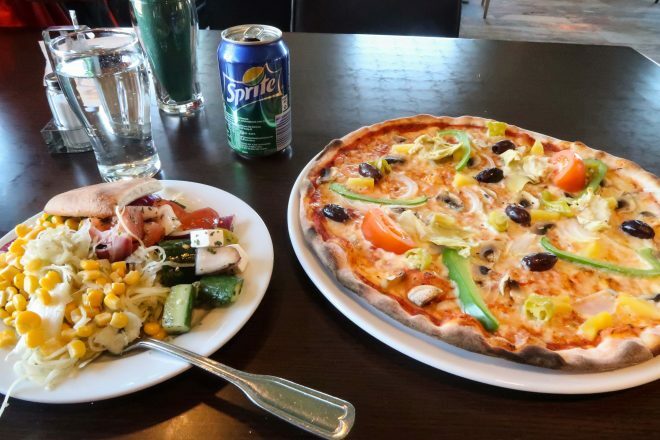 Once in Jokkmokk, Teo and Sepp and I made our way into the city center (which is easy to do in a town as small as Jokkmokk) and found a little restaurant serving up a wide variety of dishes. I ordered as pizza, Teo ordered a pizza, and Sepp ate some pasta. In addition to the food we all ordered, we were also given access to a small salad bar filled with all sorts of good vegetables. Best of all, Teo and Sepp were kind enough to buy me lunch! So, I had a delicious and filling lunch/dinner and I didn’t have to pay a single cent. Thank you Teo and Sepp! After lunch, I said goodbye to Teo and Sepp. I was limping pretty bad at this point – due to the injury I had sustained less than two days prior. My shin and entire lower right leg had swollen up pretty significantly by this point and I could hardly walk, let alone ride my bike. I told Teo and Sepp about my fall and they agreed, after looking at my leg, that I had injured myself pretty good. 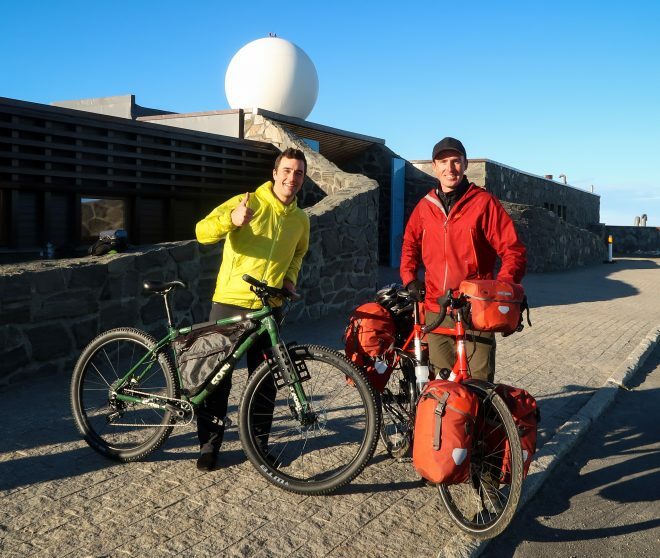 They planned to cycle another 100+ kilometers the next day, and I wasn’t sure if I would be able to reach the Nordkapp at all thanks to the injury I had sustained. So, I said goodbye to the men at this point and told them I planned to take a rest day in Jokkmokk the following day. I would find a nice, quiet place in the woods to camp… and I would stay there for two nights: eating, resting and nursing my leg. About 5 kilometers north of town, I pitched my tent in the forest next to a quiet pond and several small patches of snow. Tiny boulders dotted the landscape and I felt at home in my new sanctuary in central Sweden. The following day, I cycled into the center of Jokkmokk and purchased some muscle relief cream at the local supermarket. I spread the cream across my shin/leg several times that day, and iced the shin with snow and ice I found on the ground near my campsite. In the photo above you can just barely see the spot where the muscle or bone in my shin seems to be almost popping out of my skin. It doesn’t look very painful in the photo, but let me tell you… it hurt like crazy! The pain was so bad I could barely put my socks or shoes on. Walking was painful and riding my bike was no fun either. After a full day of rest in Jokkmokk, Sweden, I decided to press on. 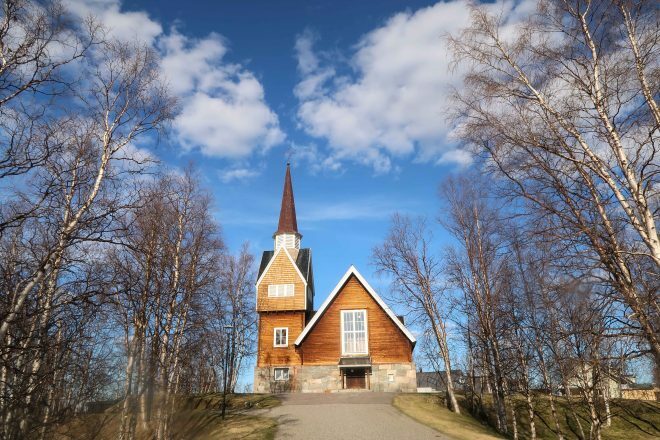 Because of my shin pain, I considered staying in Jokkmokk for another day, but I knew that if I was going to reach the Nordkapp in time, I needed to press on. So, as I had done on every previous day of the tour, I packed up my bicycle and hit the road! On this particular day, I focused on nothing else but covering some serious ground. I put my head down, tried my best to ignore whatever pain I happened to be feeling, and didn’t stop even once to take a photo. At the end of the day, I had covered over 124 kilometers! 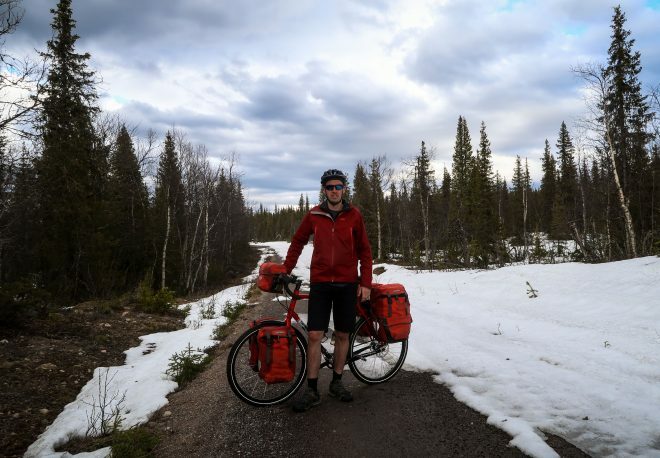 Now approximately 30 kilometers north of Gällivare, Sweden, I rolled off the main highway, cycled down a dirt road, and quickly found myself in a snow-covered swampland. What started out as a dirt road, quickly became a water-logged, snow-covered snowmobile path. Part of me wanted to turn around, return to the main road, and search for another campsite. But a part of me thought, “It’s going to be so amazing to camp here in the snow!” So, I just kept going to the road – searching for the perfect place to pitch my tent for the evening. Eventually, I settled on an elevated hillside just a short distance from the road. Getting my loaded bike through the snowbank wasn’t easy (I had to unload the panniers and carry them across the snow first, then go back for my bicycle and carry it through the snow). My shoes got wet and my feet got cold, but I managed to find a nice little area between some trees and a few patches of snow, where I then erected my tent and climbed inside for the evening. 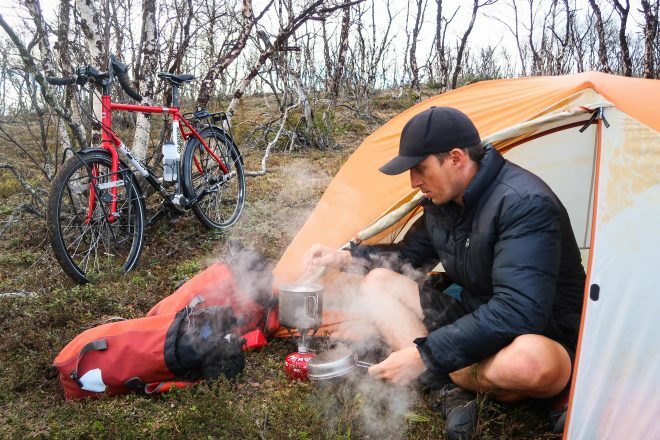 For the past several years, I’ve been traveling around the world without a camp stove, but on this particular bike tour (because I wasn’t carrying my laptop computer or my drone), I decided that I had enough room inside my panniers to pack a stove and a cook pot. To be completely honest, I’m sure glad I did! Reaching camp each night and knowing that I had a warm meal waiting for me was a very special treat. Most nights I would make pasta or vegetable burritos (two things I both enjoy and are easy to make on a camp stove). I burned through two medium-sized PRIMUS fuel canisters on the tour, each of which cost me about $7.00 or $8.00 USD. 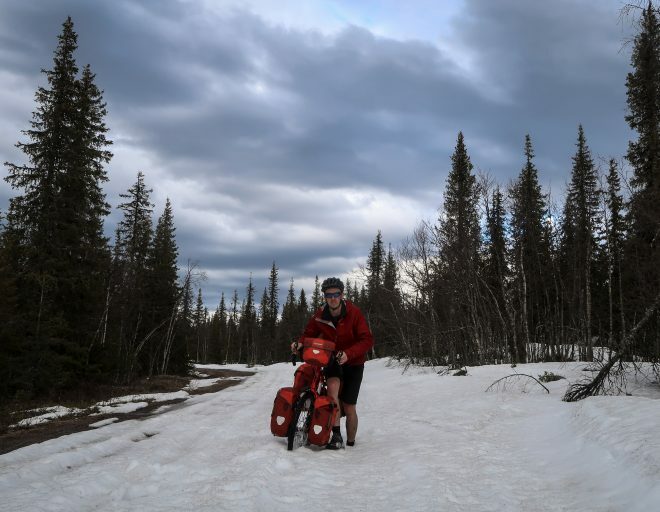 The next morning, I packed up my panniers, carried them through the snow to the dirt road below my campsite, then trudged back through the snow to get my bike. My feet were totally soaked by this point, but I was fortunate that the weather on this particular day was actually kind of warm. Don’t get me wrong! It was still very cold… but , thankfully, the cold wasn’t affecting my wet toes for whatever reason. 77 kilometers on this particular day transported me to the border town of Karesuando, Sweden. My camera batteries were all but drained by this point in my bike tour, so my goal once reaching the city center was to find a place to charge my batteries. I ordered some french fries from the town’s only gas station and charged one of my camera batteries while I was there eating my fries. Then, I made my way around town seeking out a power outlet where I could charge the rest of my electronics. I found a single power outlet on the backside of this impressive church, but then found another (more accessible) power outlet down by the river on the south side of the city. I plugged in my two camera battery chargers and then cycled down to the river’s edge to take in the scenery and allow some time to pass. Each camera battery takes approximately 2 hours to charge! While I was sitting on the edge of the river, I noticed some birds flying in the distance. At first, I didn’t think much of them, but after nearly an hour of sitting there on the water’s edge, one of the birds flew in my direction and passed immediately over my head. It was a small white, speckled owl… and it had flown so close to me that, if I had been paying more attention, I could have reached up and grabbed it straight out of the air. It was sooo cool. I’ve seen owls in the wild before, but I’ve never had one get so close to me. I waited for another hour on the edge of the river, hoping the owl would swoop past me once more, but that sadly never happened. By the time two of my camera batteries had been charged, it was approaching what would normally be nightfall. But up here above the Arctic Circle, it never really gets dark during the summer months. Still, I wanted to cycle a ways out of town and make camp before it got too late. So, that’s exactly what I did. 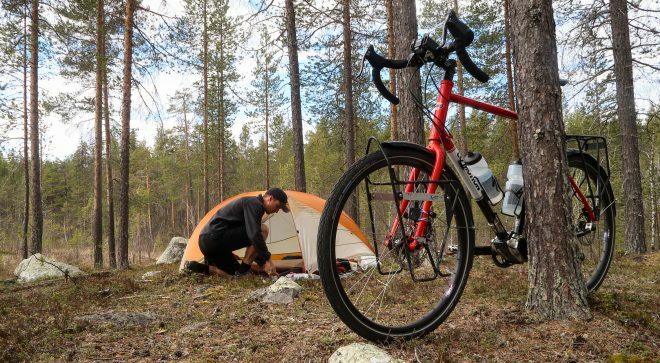 Staying on the Swedish side of the river (so I would have at least one more night of Internet access on the SIM card I purchased back in Umeå) I cycled a few kilometers outside of town, pushed my bike into the trees on the right-hand side of the road, and quickly set up camp. 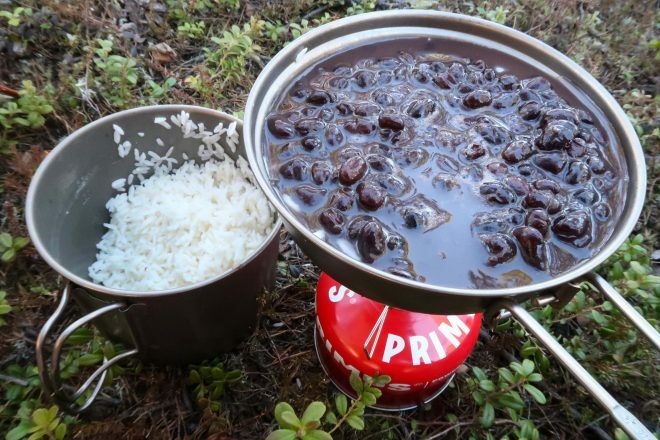 That night I cooked beans and rice and made some terrible camp stove burritos. The following morning I cycled back into town and spent a couple hours recharging the rest of my batteries at the public library. Then, once the library closed at 12:00 PM, I cycled across the bridge that would take me from Sweden to Finland. 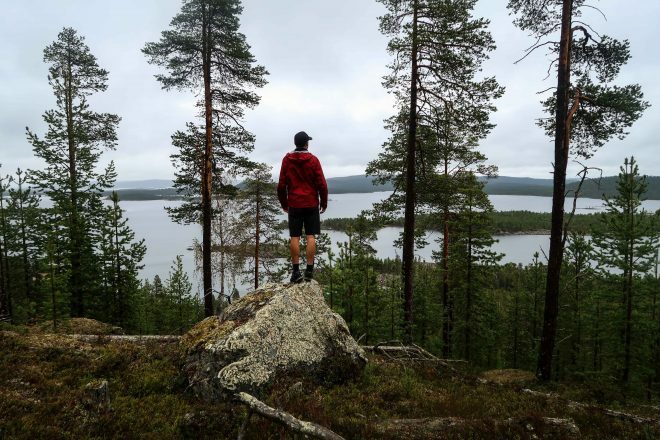 This was not my first time in Finland, but it was my first time in this particular part of Lapland, Finland. Lapland is Finland’s northernmost region – a sparsely populated area bordering Sweden, Norway, Russia and the Baltic Sea. It’s known for its vast subarctic wilderness, ski resorts and natural phenomena including the midnight sun and the Northern Lights. 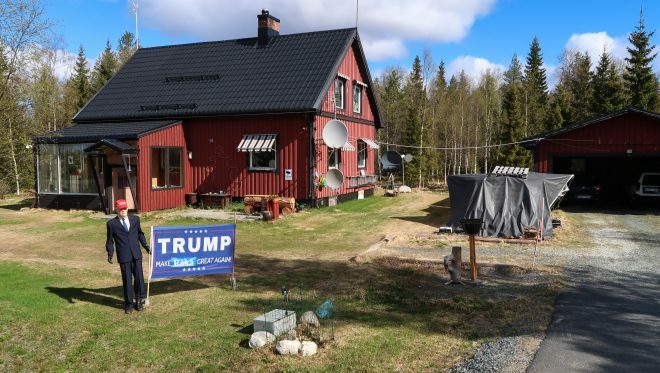 I had heard from many people in Finland that Lapland was well worth seeing, so I was looking forward to my bike ride through this particular part of the country. 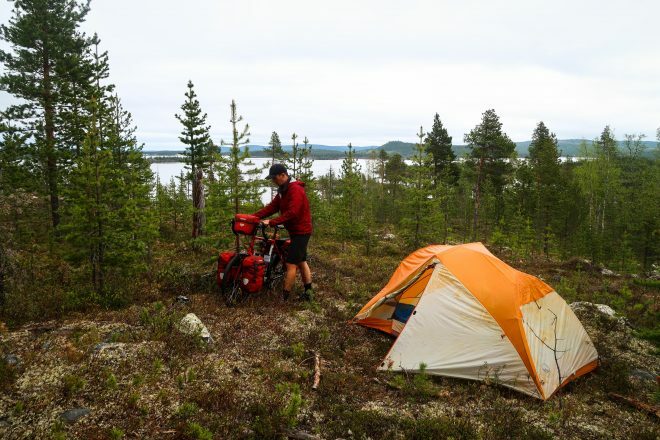 At the beginning, Lapland looked a whole lot like any other part of Sweden or Finland I had cycled through before. There were trees and lakes and rivers. But the further north I began to go, the more the landscape changed. What was once tall, green forests quickly began to morph into a short, sparse and barren brown landscape. 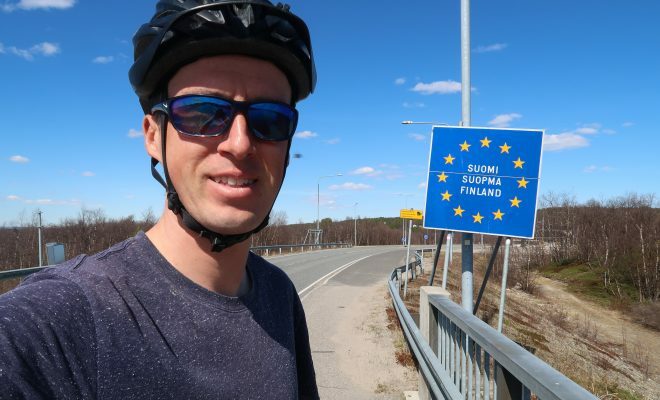 After filling up my water bottles and stocking up food in Enontekiö, Finland, I cycled north for about 14 kilometers and then pushed my bike just a short distance off the road. 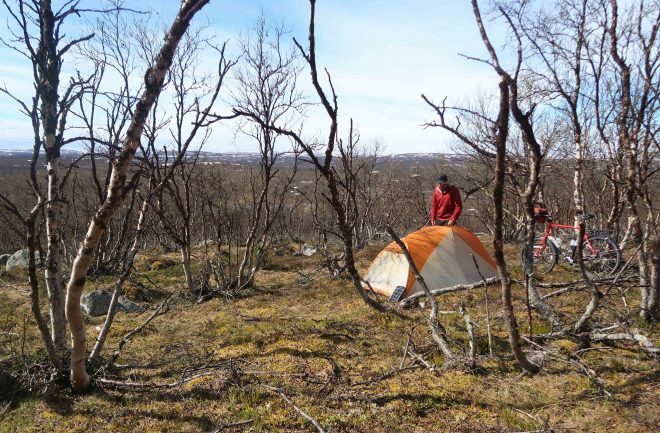 Here, back in the trees, I made camp on a small ledge overlooking a massive field – the kind of spot where you might expect to see a moose or some reindeer (at the very least) wander past. 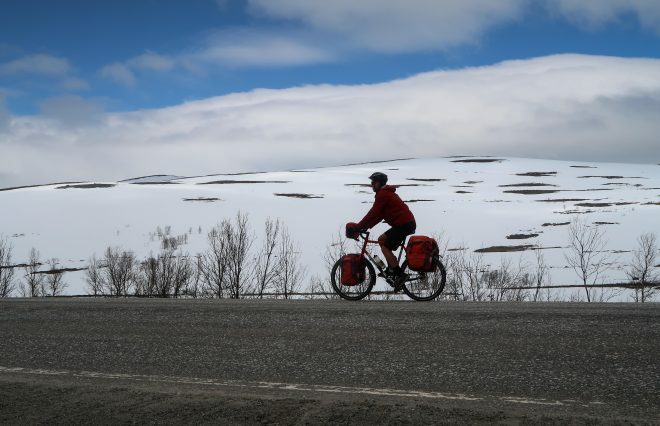 The weather on this particular day was so nice that I had been able to ride for most of the day without wearing a jacket of any kind (the first time I had been able to ride in just my jersey on this particular Nordkapp bike tour). In the evening, the weather was still very nice – so much so, in fact, that I considered sleeping in my tent without the rain-fly on it. Ultimately, however, I did decide to put the rain-fly on my tent. I know, based on experience, that the weather can change very rapidly in this part of the world. 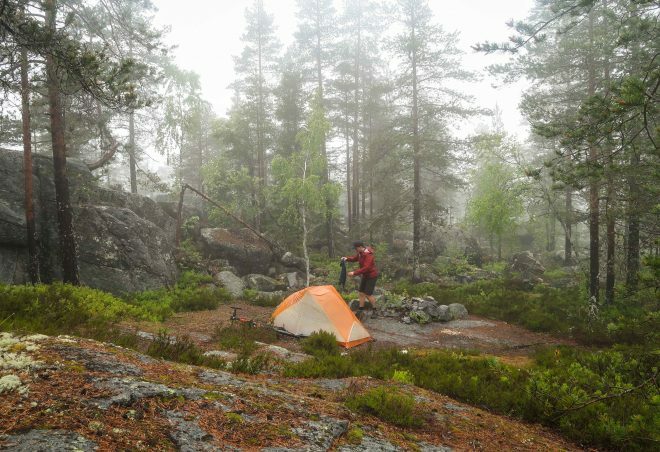 The temperatures did drop a little bit around midnight, and I was happy to be inside my warm sleeping bag during the midsummer night. 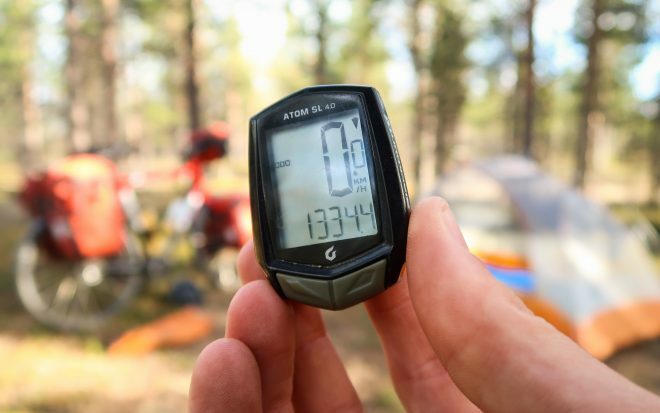 In the morning, I checked my map and my odometer and realized that I had cycled just shy of 1,000 total kilometers since leaving Umeå, Sweden. My bike computer said I had cycled 874.9 kilometers, but my map (which I believe to be more accurate), said I had cycled 980 kilometers. The reason I was missing more than 100 kilometers on my bike computer is because on this particular brand of computer (the Blackburn Atom 4.0), you have to press one of the computer’s two buttons each time you start cycling. If you don’t press one of those two buttons, the computer won’t turn on and you’ll end up cycling a considerable distance without the computer recording any of the progress you are making. So, over the course of the first 1+ week of my bike tour, I had lost more than 100 kilometers because I had simply forgotten to turn the computer on whenever I started cycling. The day before this one, I had crossed the border from Sweden into Finland. And on this particular day (June 9, 2017) I crossed the border from Finland into Norway. 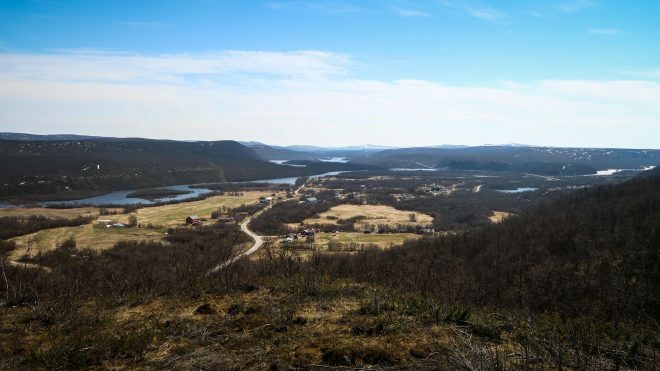 Entering the city of Kautokeino, Norway, the landscape had really begun to change. Gone were the dark green forests I had grown so used to. Now, I was surrounded by short brown shrubs and murky low-lying water. The place was a brown Arctic swamp! I refueled on food and water at the Rema 1000 supermarket in Kautokeino, then pushed my bike up the hill on the north side of the city. A short distance out of town, I made camp in a scary brown patch of wet shrubbery and felt as though I was being watched as I pitched my tent on the remote hillside. 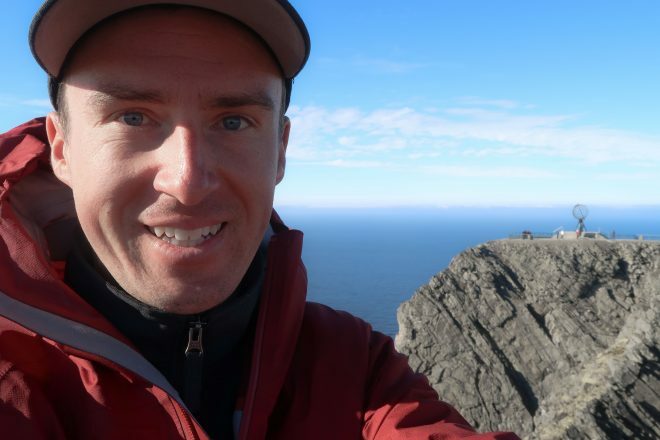 For the first time on my entire Nordkapp bike tour, I felt unwell. 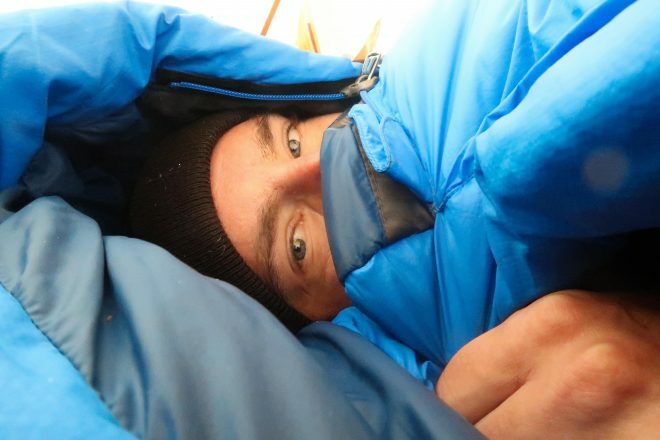 I don’t know if it was the place itself or simply my body reacting to the environment, but after setting up my tent, I crawled inside and laid down to rest. My heart was beating fast, I felt dizzy, and I was scared to be so alone and so far from home and everyone I know. A few minutes later, however, I was totally fine. You’ll note that in the photo above I was wearing my long-sleeved Fox racing jersey. I had three warm days in a row where I could wear this jersey without a jacket and what made this even more surprising was that I was further north than I had ever been at any other point in my life! On the following day, however, the weather quickly cooled. I was forced to wear my jacket again… and I would not take that jacket off until I reached the end of my bike tour more than two weeks later. On June 10th I cycled over 100 kilometers. The day began in that brown Arctic swamp I disliked so much. Then I began cycling through a resort-like village located along the edge of a long frozen river. And at the end of the day, I sprinted downhill and returned to a forested paradise just south of the city of Alta, Norway. Not yet ready to enter the “big city” of Alta, I decided to spend one more night camping in the forest. 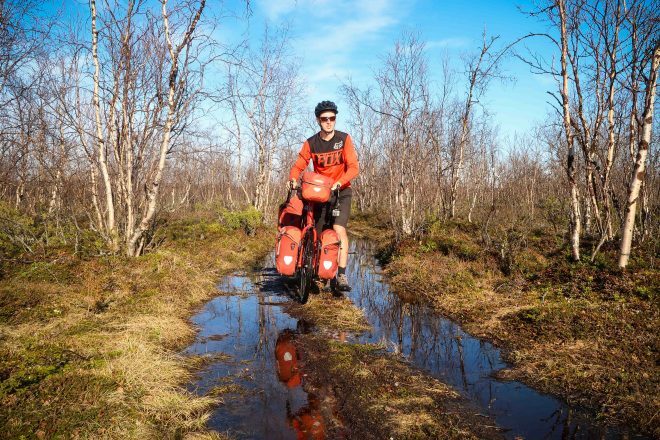 As I had done on previous nights, I exited the main road, cycled down a dirt path for several kilometers, then pushed my bike through heavy moss to a flat spot located at the top of a small creek/river. After pitching my tent, I walked to the river to refill my water bottles, then returned to my campsite and made dinner. I’ve got that one sentence nailed down so well that German speakers, like this man, seem to think I’m actually really good at German. So he went on for several minutes after that talking to me in German – of which, I only understood a few words here and there. Once in Alta, I made my way to the nearest supermarket, only to discover that the store was closed! It was a Sunday and a national holiday on top of that, so practically all of the supermarkets in town were closed. The free public WiFi pouring out of the Coop supermarket, however, had not been turned off for the holiday, so I was able to sit outside the store and access the Internet on my smartphone. As Andreas and I were talking, another man pulled up on what was obviously an unloaded touring bicycle. The bike had racks on both the front and the back, but the panniers were missing. 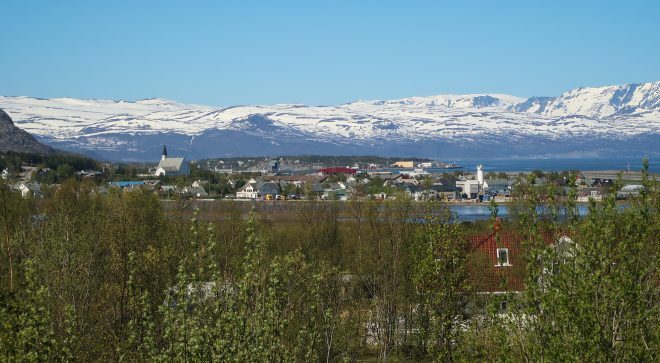 The man introduced himself and stated that he too had just come from the North Cape and that he was French and staying for the night in a campsite just outside of town. He informed me of the price for the campsite (150 Norwegian Krone, I think) and stated that the price also included a hot shower. I had been on the road for about two weeks at this point and I had not yet taken even a single shower. The only bathing I had done was in public restrooms or in freezing cold ponds and streams. I didn’t want to pay for a campsite or sleep in a campground crowded with other people, but I really wanted that hot shower… and I really wanted to recharge all my electronics. So, I said goodbye to Andreas and wished him the best for the rest of his journey. Then, I said goodbye to the French man and told him I’d likely see him later that night in the campsite. 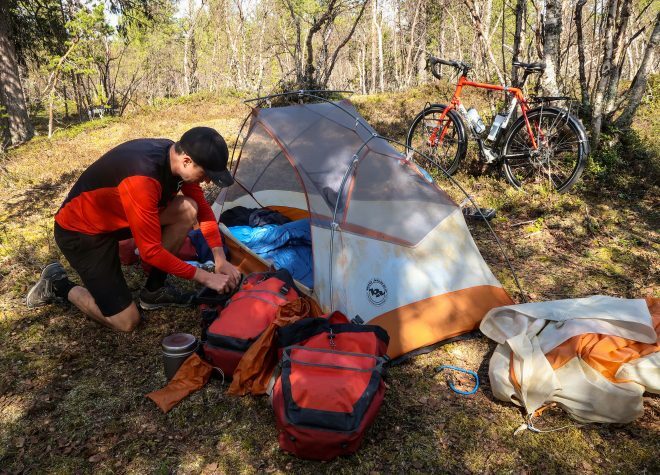 I then cycled to the city center, found the one and only store selling food on this particular day, bought enough to get me through the night, and then made my way across town to the Alta River Campground. 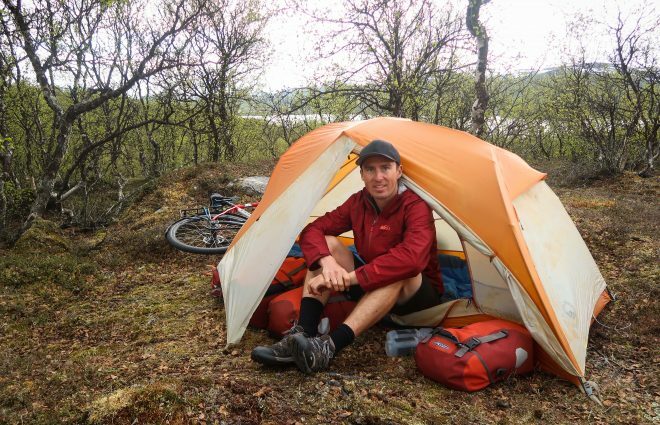 I paid 150 Norwegian Krone for my campsite and was forced to pitch my tent in a small grassy area right near the entrance of the campground. After pitching my tent, the first thing on my agenda was charging my camera batteries, so I plugged them into an outlet in the shared restroom and then proceeded to shower for the first time in two weeks. Ahhh! Later that night I rode my bicycle to a nearby river and sat along the edge of the river while cooking dinner on my camp stove. Then, after eating, I returned to the campsite, removed my battery charger from the outlet inside the restroom, crawled inside my tent and tried to go to sleep. I didn’t sleep well at the campground though. Compared to sleeping in the forest, the ground was hard and it was noisy. There were cars and motorcycles coming in and out of the campground all night, there were people talking, and there were people walking past my tent at all hours of the night. As hard as I tried, I just couldn’t get to sleep! When morning came around, I had slept for only a few hours (3 at most). But it was time to pack up and hit the road. So I packed up my bike and then I hit the road. I wanted to get some food before I left the city… and I also needed to try and find some fuel for my camp stove, as Alta was the last major city on my map for quite some time. So, I cycled to the city center and went into the first supermarket I spotted. The man’s name was Trygve and he was from Fredrikstad, Norway. He informed me that he had watched all of my videos on YouTube and it was those videos that inspired him (at least in some way) to conduct this long-distance bike tour in celebration of his 40th birthday. 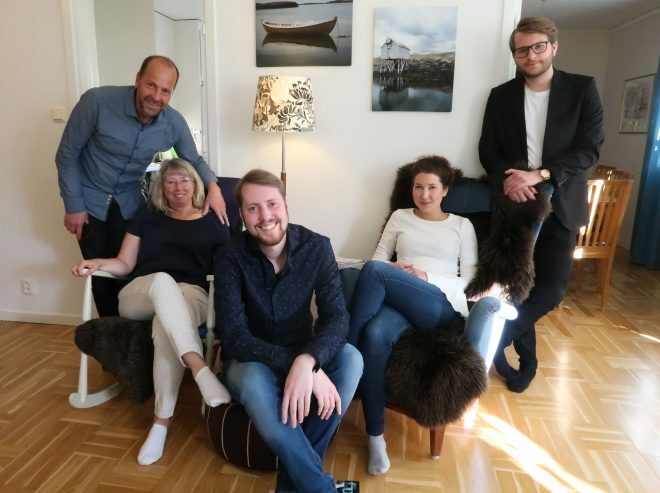 “I have to buy extra data for my smartphone every month because I watch and re-watch all of your videos on YouTube,” Trygve told me at one point. We took some photos together and then Trygve went inside the supermarket for a moment while I stayed outside and watched his bike. When Trygve returned, he had a coconut pastry and a cappuccino drink for the both of us. We sat and ate/drank together for a moment while discussing our travels… and then we went our separate ways. 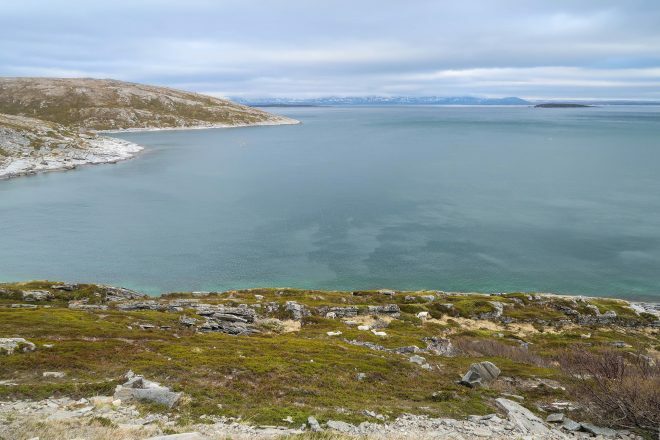 I went north toward the Nordkapp and Trygve went south toward his home. 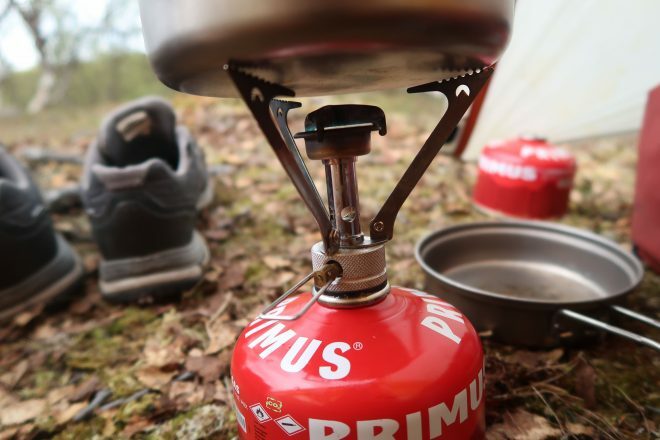 Before leaving town, I found a store called Claus Olsen inside the Alta shopping mall and managed to score a new fuel canister for my camp stove while I was there. 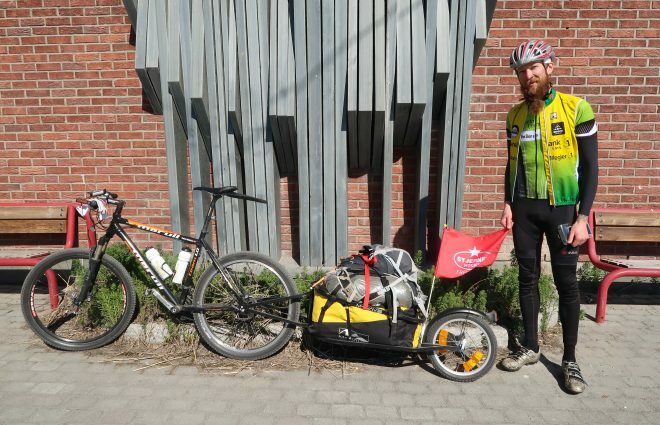 Now with food, water and fuel loaded onto my bicycle, I left the city of Alta behind and began cycling north. The bike ride out of Alta, Norway was a nice one. There was a bike lane at the start, which followed the water north up the coast, and then transitioned into a quiet two-land road. At the base of a large hill, I spotted a bicycle tourist zipping down the road in front of me. I pulled over to videotape the man as he passed, only to realize moments later that he wasn’t alone – and that he was cycling with a small group of people. 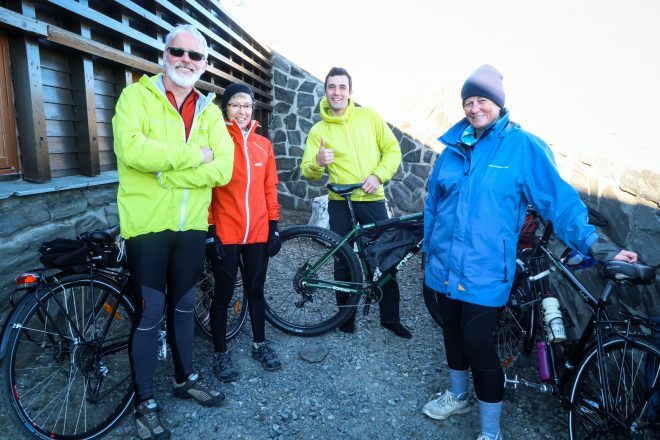 Artis (on the far right, above) and Andris (on the far left) are two Norwegians who were cycling together from the North Cape south… who just happened to meet up with June (in the pink) and Vanja (in the yellow) near the Nordkapp in northern Norway. Because they were headed the same direction, the group decided to cycle together for a while. We stopped and chatted for a moment, took a few photos together, and then went our separate ways. After leaving Artis, Andris, June and Vanja, I immediately began cycling up a long, steep hill – the largest hill I had encountered on the entire bike tour thus far. Luckily, it wasn’t the longest or the steepest hill I’ve ever climbed… and I quickly made my way to the top. But once I reached the top, I noticed an instance change in the landscape. While the city of Alta, Norway had been warm and covered in green trees, this new elevated place I found myself in was barren and covered in snow! Everywhere I looked there was snow and melted water. It was a brown and white Arctic landscape… and it was cold. Several kilometers down the road, I spotted a young man with a yellow jacket and a yellow set of panniers on his bicycle pulled over on the side of the road and eating what appeared to be a sandwich of some kind. I pulled my bike off the road and spoke to the young man for a bit. He was German and traveling alone for several months. He seemed a bit tired, or lonely, or something (I couldn’t quite put my finger on it), so I tried to give him some encouraging words of advice… and then I said good bye, wished him the best, and continued on my way. No more than 200 meters down the road, I spotted two more bicycle tourists! 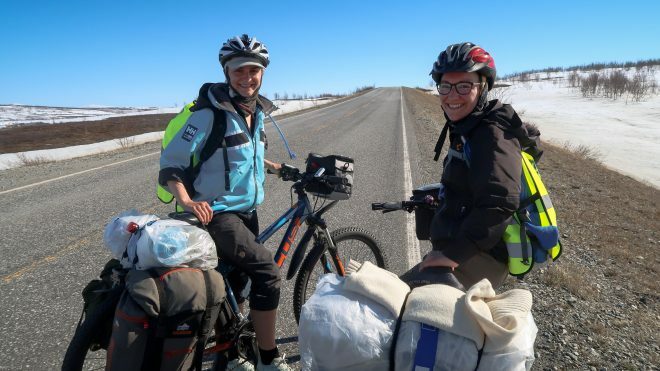 Once again, I pulled over to talk with the bicyclists and discovered that they were two Norwegian sisters who were traveling from the Nordkapp to Bodo, Norway via Tromso and the Lofoten Islands. The one sister (on the right – in the black jacket) had done this exact same bike ride the summer before and had liked it so much that she had recruited her sister to do it with her again this year! They were both in good spirits and seemed to be enjoying their ride together. After meeting so many bicycle tourists in such a short time span, I realized that I was on a very popular bicycle touring path. 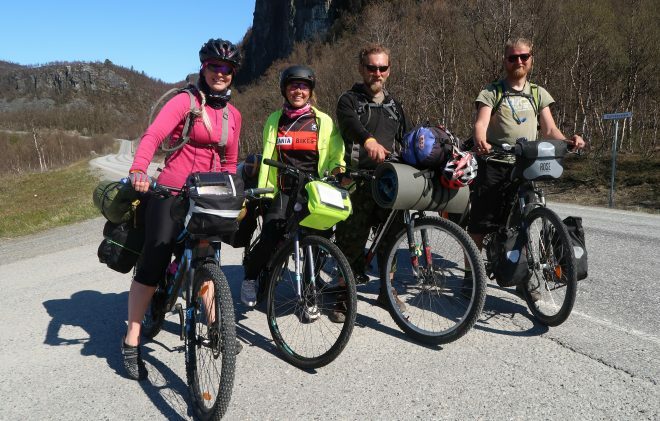 Most of these cyclists had flown to the Nordkapp and were then cycling south through the Lofoten Islands to Bodo, Norway and were then flying home from there. 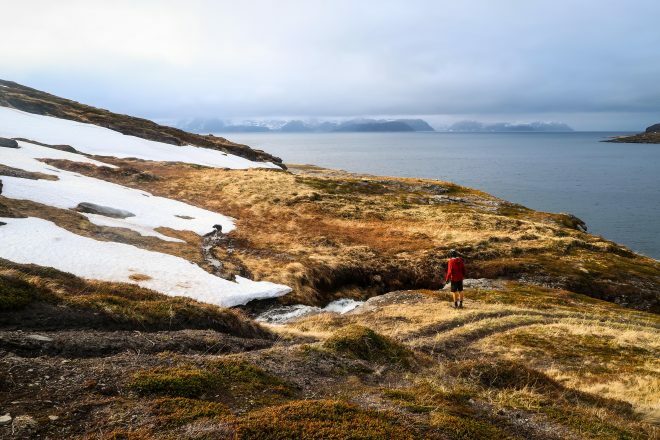 Having done most of that route myself (but not necessarily in that exact order), I can very confidently say that this is a fantastic place to go bicycle touring… and riding from the Nordkapp to Bodo via the Lofoten Islands is a wonderful way of going about it. Shortly after meeting the two sisters, I spotted another woman sitting with her bicycle on the side of the road. She was stopped there with her clothes and belongings all sprawled out, but she appeared to be in no trouble – as she was calmly sitting and eating some kind of food. “Hmm…” I thought to myself. It was already pretty late in the day at this point, but I had wanted to go another 20 kilometers or so. I didn’t want to cycle 60 kilometers (that would be too far!). But I certainly didn’t want to stop right there and call it a day. So, I just waved to the woman and shrugged my shoulders. I was pressing on! I’ve learned over the years that you should be careful who you listen to when you’re traveling by bicycle. The directions most people give are no good at all. 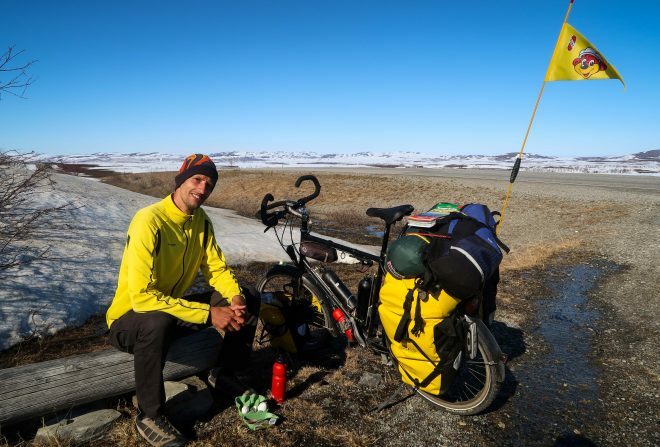 I’ve been traveling the world on a bicycle for a very long time, so I knew that even though the woman said there was nowhere to camp, I could very likely find a place to pitch my tent for the evening – even in this cold, barren Arctic wasteland. So, I continued… And it’s a good thing I did, because I ended up spending the night in one of the most incredible places ever! The woman was right, to some degree, however. There landscape was barren and there was water everywhere. Almost every patch of land on the side of the road was wet and water-logged. Plus, there were a bunch of private homes scattered along the roadside, which made camping in those areas completely off-limits. At some point, however, I spotted a small ridge just off to the left side of the road. 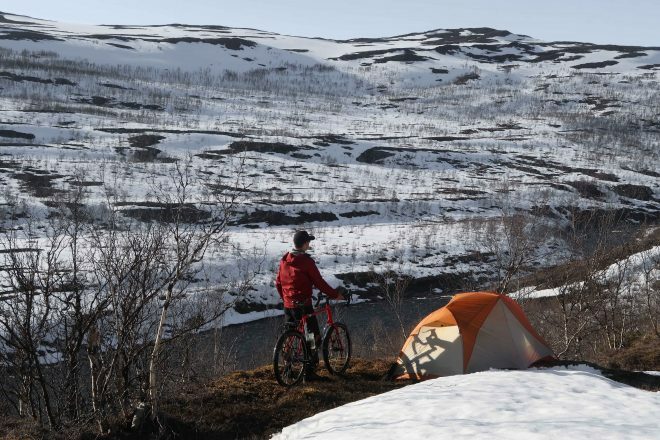 I pushed and then carried my bike over that ride, then walked my bike through several feet of snow, before finding the perfect spot to pitch my tent for the evening. 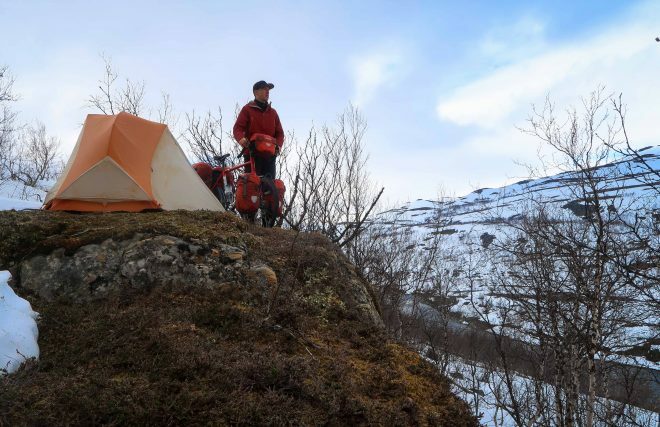 I ended up camping on the edge of a small cliff overlooking a river surrounded by snow! It was easily one of the best campsites I have ever had anywhere in the world! After setting up camp, I cooked dinner on my camp stove and then sat inside my tent with the rain-fly open, just staring out at the river and snow and mountains that surrounded me. The view from my sleeping bag was so incredibly spectacular! And even though I know it looks really cold in these photos, it was actually pretty comfortable. I sat there for most of the evening in my shorts and only changed into my long pants once it was time to go to bed. In the morning, I didn’t want to leave. 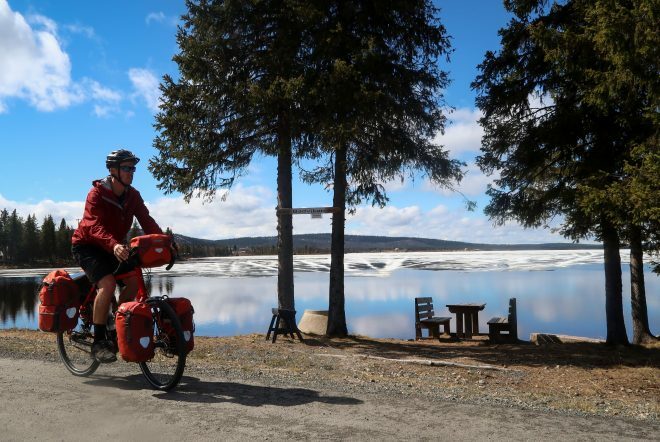 But eventually, I packed up everything I was carrying with me, pushed my bike back through the snow, carried my loaded touring bicycle down to the road and then began cycling north. But that turned out not to be the case. After no more than 40 kilometers, the road took a deep dive down toward the sea and in the a matter of moments the snow that had surrounded me for the last couple days had suddenly disappeared. In the tiny coastal town of Olderfjord, Norway I stopped for a few minutes and looked around the gift shop, then went into the bathroom and refilled my water bottles. From there, it was only another 130 kilometers to the Nordkapp! The bike ride north of Olderfjord was a scenic one. The road was relatively flat, running along the coastline, with a thin stretch of land between the street and the sea. On this small stretch of land were dozens and dozens of grazing reindeer – many of which would run in front of my bicycle for hundreds of meters in an attempt to get away from me, before eventually running across the road and up a steep hill on the other side, or dashing their way to the distance seashore on my far right. 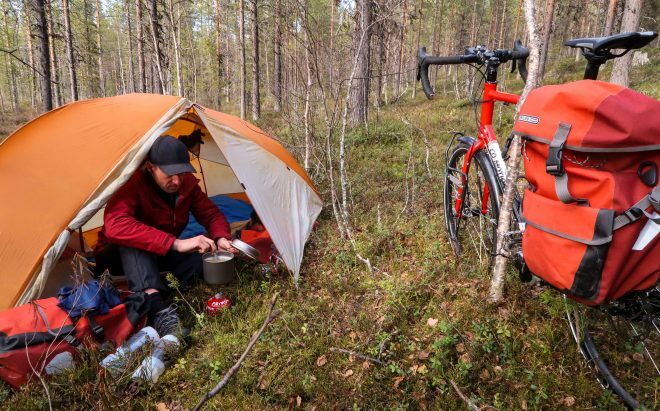 After a long and very cold day of cycling (more than 100 km) I pushed my bike up a steep dirt road and pitched my tent in a flat area just a few meters away from a rushing stream/waterfall. By the time I pitched my tent on this particular evening, it was pretty late in the day (close to 9 PM) and there were very few cars out on the road. It was freezing cold (one of the coldest days of the entire bike tour) and I was exhausted, but the view from my tent was incredible. In the distance I could see the islands I would need to cycle over to the following day. And just beyond that was the Nordkapp! I woke the next morning wishing I could get another 6 hours of sleep, but I needed to press on. I still had a good 50+ kilometers to go until I reached the Nordkapp and I knew that it was going to be a challenging day, with several different tunnels I would need to ride through… and at least one or more big hills. 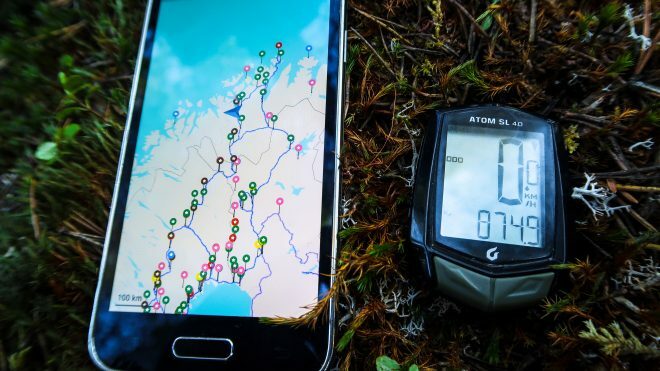 My campsite was located just a few kilometers from the south side of the tunnel that would take me from mainland Norway over to Magerøya island. It only took me a few minutes to reach the tunnel entrance on my bike… and from there it was a step downhill ride, below the sea, and into the depths of this 7+ kilometer-long tunnel. I don’t have any photos from inside the tunnel, but let me tell you… it was not fun! I enjoyed the downhill ride at the beginning, but riding uphill and out of the tunnel with the roar of semi trucks, RVs, motorcycles and automobiles coming up behind me and passing within inches at times caused me a great deal of anxiety. I had to pull over on more than one occasion just to calm down, control my breathing and try not to freak out. I’ve ridden through a lot of tunnels in my time, but this tunnel (because it was so steep and so long) was one of the worst tunnels I have ever cycled though. The only thing going for it was that the traffic was fairly light. 15 kilometers up the road or so, I pulled into Honningsvåg, Norway. To my surprise, the last town before reaching the Nordkapp was a whole lot larger than I had expected it to be. The city seemed to run down the entire eastern coastline of the island. Lucky for me, I wouldn’t need to stop in town just yet. I was going to cycle straight past the city and go directly to the Nordkapp. Then, my plan was, to jump on a bus and take that bus back to Honningsvåg in the evening. I had no idea that the bike ride to the Nordkapp was going to be so difficult. I had been on the road for about 2.5 weeks at this point, but the most difficult climbing of the entire tour was easily during these last few days. The road leading out of Alta… the tunnel connecting Magerøya to mainland Norway… and then finally, the road leading to the Nordkapp all had considerable hills to climb. The good thing about my bike ride to the North Cape, however, was that on the day that I was there, the weather was actually very good. Don’t get me wrong, it was still very, very cold. But the sky was clear and the visibility was high. 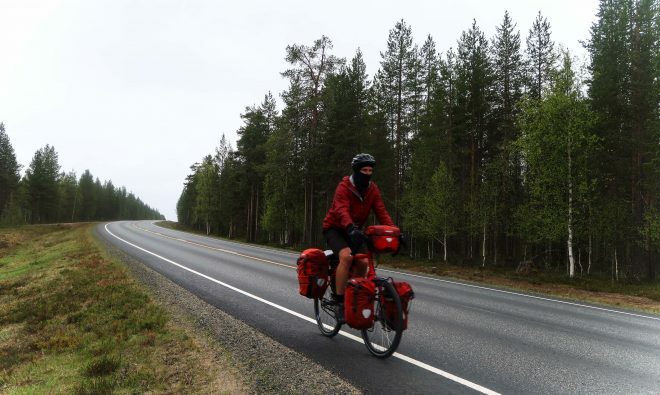 I had heard from several of the bicycle tourists I had run into over the last few days that when they were at the Nordkapp it was cold and foggy and that you couldn’t see a thing. So, I had timed my bike tour to the Nordkapp just right as far as the weather was concerned. It’s a little difficult to describe what it’s like there at the Nordkapp. When you come up the road you first spot the massive parking lot filled with cars and buses and (more than anything else) RVs. After going through the parking lot, you approach a large stone building and enter through the sliding doors at the entrance. Once inside, an individual at a small information desk points you in the direction of the gift shop, attractions, restaurant, bathrooms, etc. Then, on the north side of the building, just a short walk down from the building, is a large metal globe with dozens of people circled around it taking photos of themselves. Being there all alone, I didn’t really try to get a picture of myself with the globe. I was there! I had made it! And knowing that was all I needed to take with me. 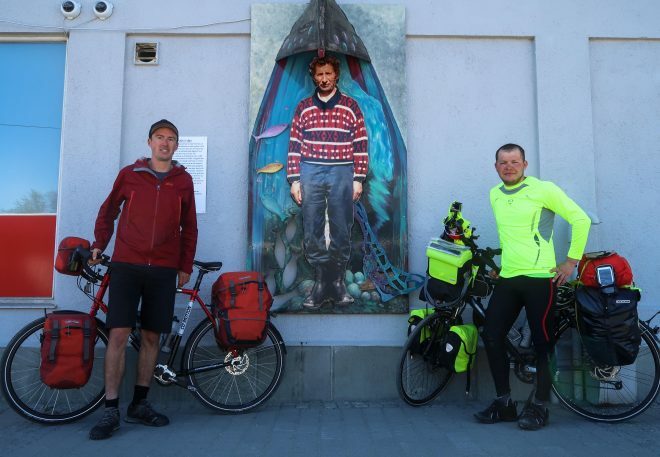 On the east side of the Nordkapp building I spotted another bicycle traveler. I cycled over to introduce myself and he then asked if I would take his photo. I snapped a few pictures of the man using his iPad, and then he asked if I wanted a picture too. 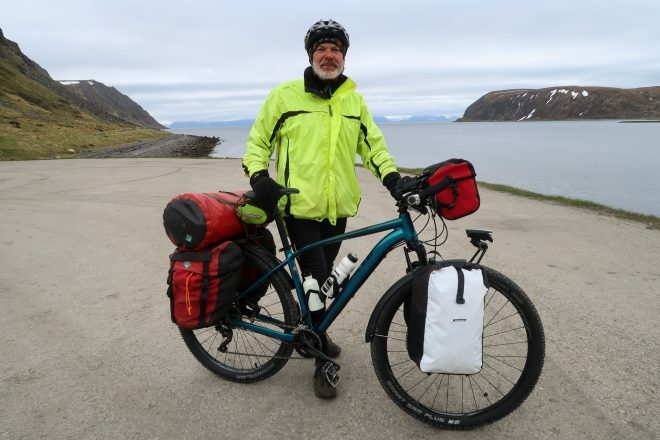 The image below is the photo he took of me at the Nordkapp with my bicycle. The woman at the information desk inside the building informed me that there was indeed a bus going back to Honningsvåg that evening, but that it didn’t leave for at least a few hours. That was fine with me! I found a free power outlet inside the building, plugged in one of my camera batteries, and then sat inside (keeping warm) while answering emails and responding to messages on my smartphone. Mark went on to explain that he had recognized my bicycle from the photos I’ve posted on the Bicycle Touring Pro website and knew for a fact that it was me when he spotted the custom “www.bicycletouringpro.com” paint-job on my bicycle’s rear chainstay. “We were thinking about doing this bike tour,” Mark went on to explain, “and figured, surely someone must have done this before.” And that is how they discovered www.bicycletouringpro.com! 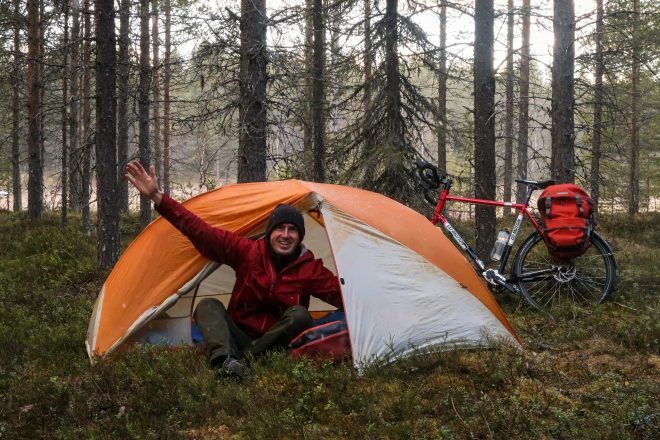 They had simply searched the Internet for other people bike touring in Norway… and found me. How cool is that!?! I agreed to wait and the young man returned just a few minutes later with his bicycle. 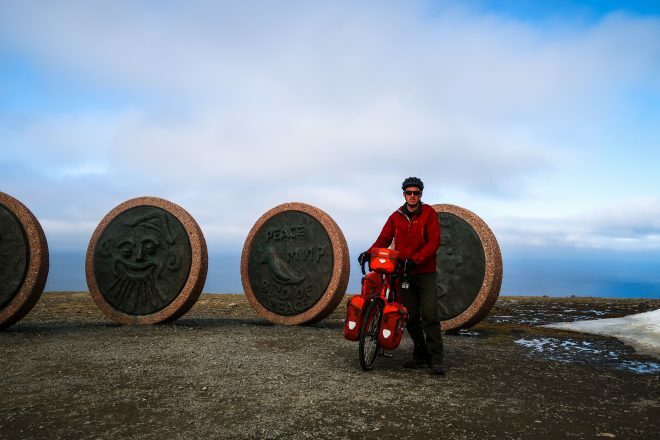 We took a few photos together and then he informed me that he was working at the Nordkapp hotel, but that before that he had been conducting several short bike tours around Norway. I would have liked to have stayed longer and talked with all my new bicycle touring friends, but at exactly that moment the bus to Honningsvåg pulled up and I had to say goodbye. 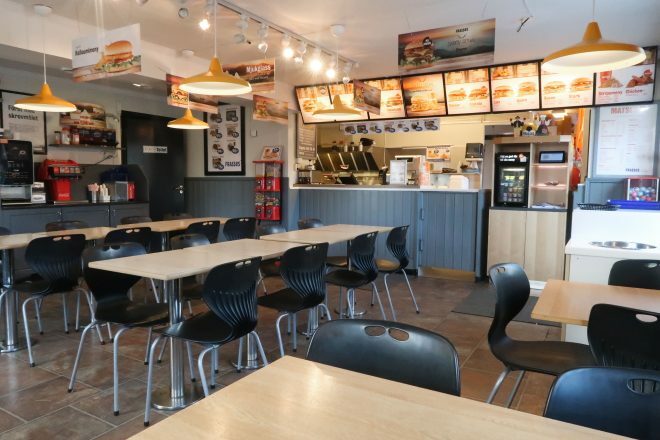 I threw my bicycle into the bus’ lower luggage compartment and then jumped on board – paying quite a hefty fee to be transported back to Honningsvåg. It was only a 30 kilometer bus ride back to Honningsvåg, but I was happy to pay the price to take that ride. It was warm inside the bus, and there’s nothing I like less than cycling down a road I’ve just cycled down a few moments before. I had reached the Nordkapp… and now it was time to turn around and begin making my way back to Umeå, Sweden. By the time the bus arrived in Honningsvåg, it was well after 8 PM. I didn’t know where I was going to sleep that night, so I looked at my map and made an educated guess as to where I thought I might be able to find an isolated spot to pitch my tent for the evening. I rode out of town on Nordvågveien street toward the nearby coastal town of Nordvågen. On the left side of the road I spotted a small turn out where it appeared as though other people had camped in the past. Sheltered from the road by a small rock pile, I quickly set up my tent, collected water from a nearby waterfall, and cooked my dinner in the shelter of my tent. The next morning I planned to take the bus from Honningsvåg back to Oldersfjord. This way, I wouldn’t have to backtrack for more than 100 kilometers on the road I had cycled the day before, and I wouldn’t have to go through that terribly long and steep tunnel leading between Magerøya and the mainland. The only problem was, I didn’t know what time the bus left Honningsvåg. I had tried to find the schedule online, but had had no luck. So, I woke up early, cycled to the center of town and asked at the information office when the bus was leaving. To my surprise, I had timed things almost perfectly! There was another bus coming in less than an hour! Using the little time I had, I went and stocked up on food at a small, local supermarket and then waited at the bus station for the bus to arrive. The bus ride to Oldersfjord was far too short. There was free WiFi on the bus, so I used the time to get a little work done… and most importantly, to stay warm. It was another cold day in northern Norway! 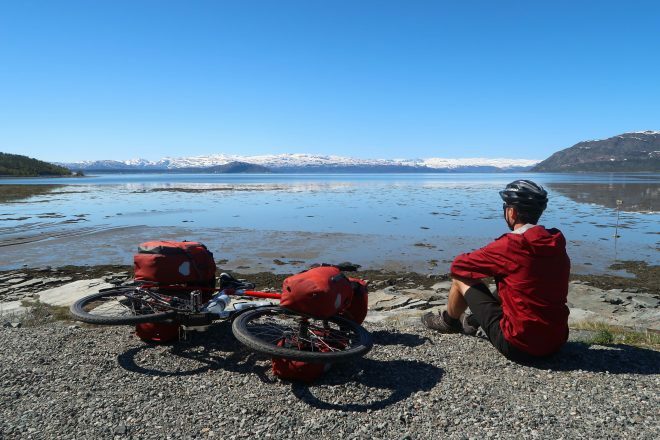 Once I got off the bus in Olderfjord, I filled up my water bottles and then immediately began cycling south. The weather had warmed quite a bit at this point and I had to stop and put on my shorts, as I had been wearing my snow pants before that. I didn’t cycle far on this particular day (only 35 kilometers) before pushing my bike off the road and up a steep trail to a flat spot at the top of the hill. From my campsite I could see a large lake off in the distance… and once again, I was alone in the wilds of northern Europe. I loved it! So, I plugged in two of my camera batteries and then cycled across town to a nearby pizzeria for lunch. 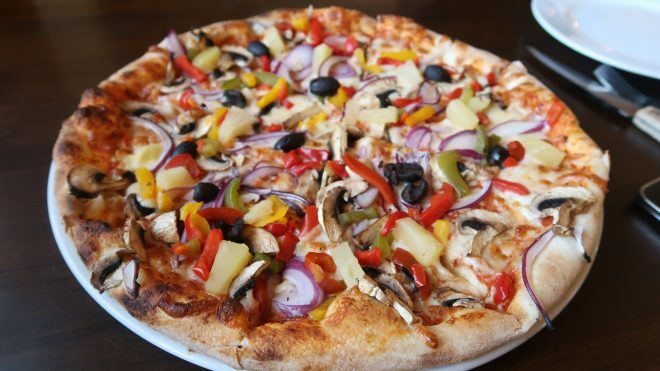 I ordered a vegetarian pizza and then sat there in my booth for more than an hour after eating – just so I could use the restaurant’s WiFi to download more new podcasts to my smartphone. Apparently, this particular part of Norway is not especially popular with international tourists. 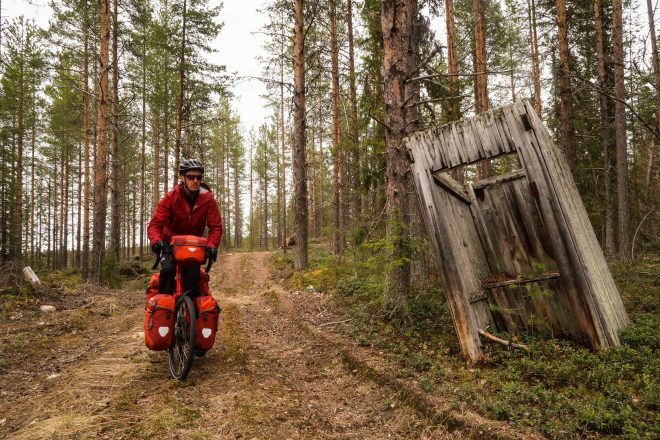 But that’s what tends to happen when you go on a long-distance bike tour: you end up exploring areas that most other travelers simply skip over or ignore. 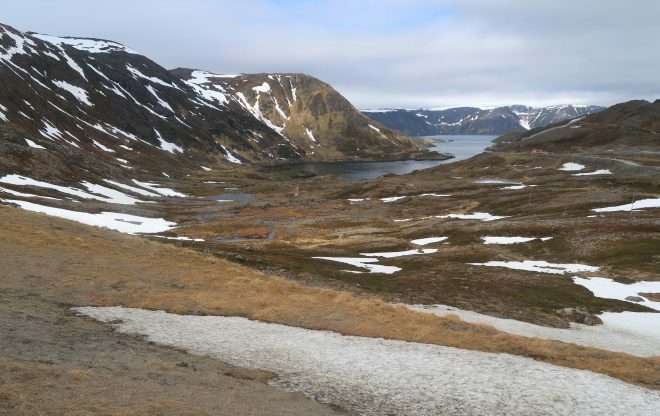 Leaving Lakselv, Norway, the landscape quickly changed from seaside and green forests to that brown, barren, Arctic wasteland I had cycled through days before on my bike ride north toward the Nordkapp. I did not enjoy cycling through this particular region. It was ugly and it was difficult to find any place to camp – as the land was wet and watered down in almost every easily accessible place. Lucky for me, I managed to find a small hillside on which to pitch my tent for the evening. My campsite was uncomfortably close to a small roadside rest area, but I figured it wouldn’t be a problem, as this particular part of Norway was very lightly traveled. One car might pass every five minutes or so. Even though this particular camping spot was not my favorite, it worked out well. Once my tent was pitched, I realized I had a pretty good view of the valley in front of me and the mountains in the distance. And because there were no trees to shelter me from the sun, it meant my campsite was relatively warm and my solar power was free to do its thing. The following day I had two major goals. 1) Charge my camera batteries some more in the nearby town of Karasjok and 2) cross the border from Norway into Finland. 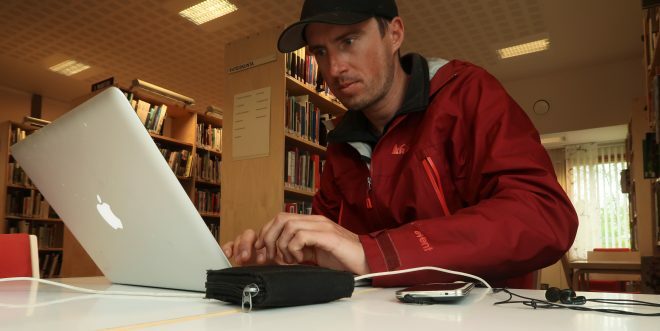 I knew by looking at my map that there was a public library in Karasjok where I could likely charge my batteries, but when I got to town, the library was closed. There was some kind of street fair going at the time and there were musicians standing under a small awning and performing to a crowd of no more than fifty people. I cycled around town for a while, trying to find a place to plug in my batteries. I even asked at the local information office (as I had done the day before) if they would be willing to let me charge my batteries there, but the young man working behind the desk didn’t seem to be open to that idea. So, after failing to find a public power outlet, I decided to simply stock up on food and water and hit the road. I had enough camera batteries to get me to the next town… and hopefully I’d find a place to charge my batteries once I arrived there. A short while later I cycled across a large river and then crossed the border from Norway to Finland. Almost immediately, I was confronted with a large hill that seemed to go on and on and on. It was one of those hills that just when you think you’re about to reach the top, the hill reveals that it has even more in store for you. And when you reach the top of that hill, there’s even more uphill climbing beyond that! I thought that Finland was flat, but this hill right at the border was far from what I expected. That night, I ended up finding the most beautiful campsite in a forested area just off the side of the road. 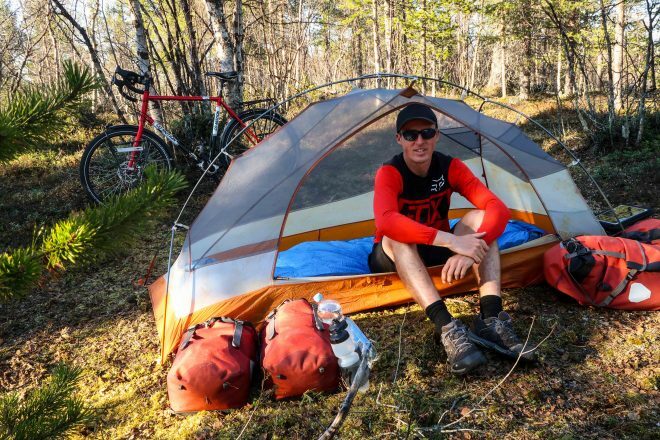 I cycled down a dirt stretch for a little bit and then pitched my tent in an open flat spot near two small ponds. That night, before going to bed, I snapped this photo of my odometer, which showed that I had cycled some 1,334.4 kilometers by this point in my tour. 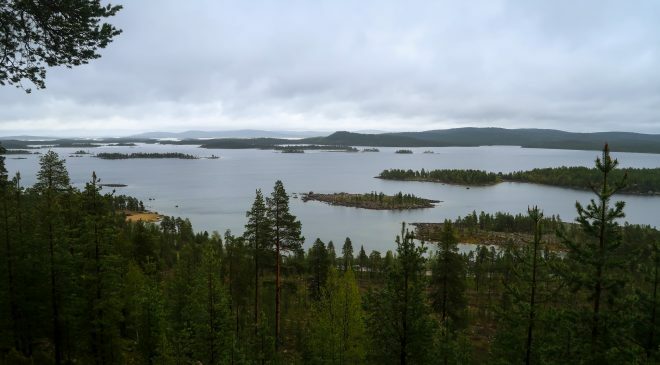 About 20 kilometers north of Ivalo, Finland, it started to rain. It was raining so heavily that I was having trouble seeing, so I pulled my bike over to the side of the road, pushed my belongings up a dirt logging road, and then found a campsite on the hillside overlook a massive lake. From my hillside campsite I could see dozens of small islands in the distance. It rained all night long and my tent started leaking from every direction. Water was getting in through the rain-fly above me and dripping onto my head as I slept. At the base of my tent, a small pool of water was forming, and when I woke up in the morning my down sleeping bag was moist at the toes. I didn’t want to spend the entire day cycling in such intense, cold rain, so I went back to sleep… and when I woke up again around noon, it was still raining. The rain didn’t stop until 5:00 PM – at which point I crawled out of my tent and considered packing up and cycling a short distance into town, at the very least. But it was already so late in the day, so rather than go anywhere, I just left my tent where it was and went on a short hike. I climbed up to the top of the mountain under which I had laid for the last 20-something hours and I snapped a few photos of myself and the scenery. It continued to rain on and off all night long, and when I woke up the following morning, it was still sprinkling, but the rain had largely subsided. 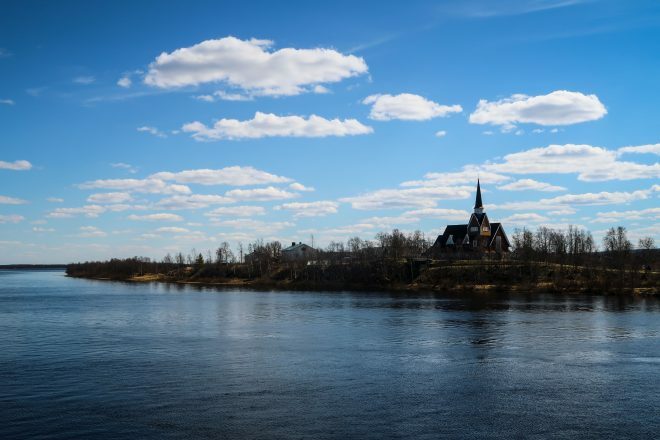 So, I packed up my bicycle and cycled into the nearby town of Ivalo. Once in town, the first thing I did was go to the public library and plug in my camera batteries. As you can tell by this point, this became an ongoing part of my daily route. Every single day I had to look for food and water, find a place to sleep each night, and continually search for electricity and internet. I spent 6 hours at the library that day, got three of my camera batteries charged, and charged my smartphone to 100% as well. Before leaving town I ate a disgusting thin-crust pizza from a local restaurant, stocked up on food and water, and then began cycling south. I had spent almost the entire afternoon in the Ivalo public library, so I didn’t expect to cycle very far on this particular day, but I was well rested after having spent the previous day just lying in my tent listening to podcasts and writing in my journal, so I cycled well into the evening. After 8:00 PM, the traffic on the road died down so much that I was able to cycle for more than 20 minutes sometimes before I saw even another individual. It was a wet and rainy day of cycling, but I managed to cycle over 105 kilometers. Toward the end of my day, I spotted this young man (shown above) traveling in a camouflage wilderness jacket. When I saw him approaching me in the distance, I at first thought he might be a moose or animal of some kind. But as he got closer I saw that, yes, he was a bicycle traveler. I didn’t get the young man’s name, but he said he was going to stay at a friend’s house nearby and that he was trying to get there before it became too late in the evening. An entire day passed after that and I didn’t take even a single photo for more than 24 hours. Then, I snapped these two images from what would be my very last night in Lapland, Finland. 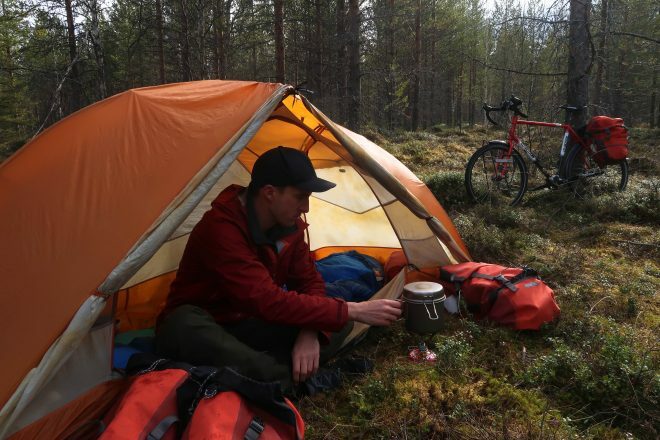 I spent the night camped out a few kilometers north of Rovaniemi, Finland… and the following morning I cycled into town and began looking for the bus station. While I would have liked to have cycled all the way back to Umeå, Sweden on my bicycle, my time had run out. 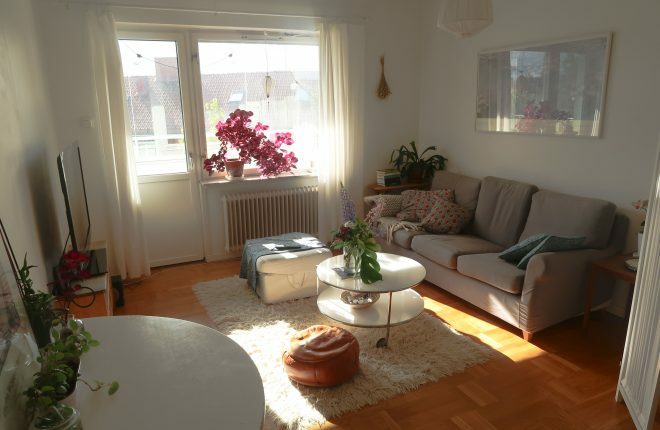 I needed to be back in Umeå by 2:00 PM on the 25th of June so I could meet the young woman I had rented my apartment from and check into the place that would be my home for the following 40 days and nights. So, in Rovaniemi, I went to the bus station, only to discover that I had missed the last bus of the day. There was no one working at the bus station that night and there wasn’t another person in sight. There wasn’t even a schedule of when the buses might be running the following day. On top of that, this was the Midsummer holiday in Finland and Sweden, so I wasn’t even sure if the buses would be running the entire weekend. I waited at the bus station for more than an hour to see if anyone might turn up who could help me or give me some information. That’s when a giant double-decker bus pulled into the station and I ran over to the bus driver and asked her for assistance. The middle-aged woman didn’t speak much English, but she was able to hand me a bus schedule and say that yes, the buses were running tomorrow. 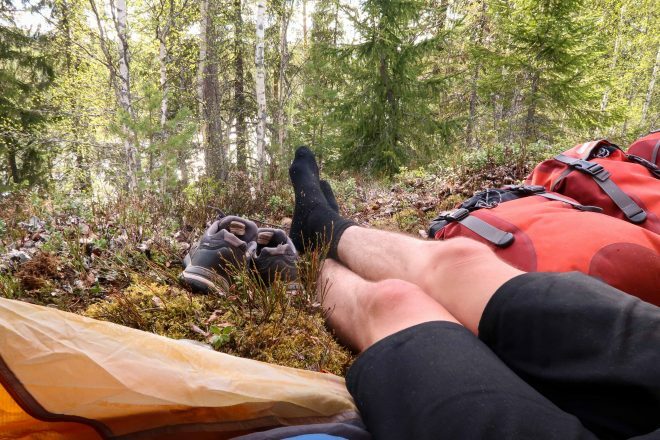 Stuck in Rovaniemi for the night, I cycled north out of the city and down a quiet dirt road before finding a small patch of land on which to pitch my tent. 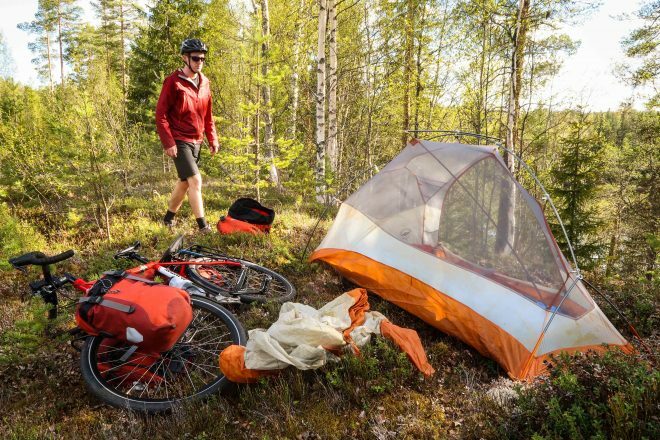 As I began setting up my tent, the mosquitoes began to swarm and I realized that this was really the first time on my entire bike tour when I had had to content with mosquitoes. I rushed to get my tent setup and then jumped inside as quickly as I could – vowing not to exit my tent until the following morning. By the time I got the zipper on my tent closed, there were dozens of mosquitoes already inside, and hundreds more swarming around outside. I killed the little guys who had made their way into my tent and then spent the next 20 minutes splashing the walls of my tent with citronella oil – hoping that would make the mosquitoes go away. A few minutes later – they were all gone… and I spent the rest of the night sleeping peacefully in my tent. 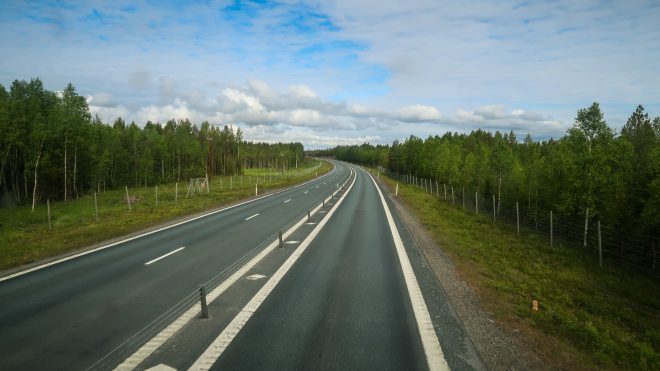 There were at least three buses that day going from Rovaniemi to Umeå, Sweden. Not wanting to miss my opportunity to get back to Umeå on time, I jumped on the earliest bus and left town just a few minutes after 8:10 AM. It was a 7+ hour bus ride back to Umeå, but I enjoyed every moment of it. After having spent the last month of my life living outside and in the forest, it was wonderful to be inside, warm and comfortable. Plus, riding on the bus meant I got to see several small Swedish cities I had never seen before: Kalix, Luleå, Piteå and Skellefteå. Once the bus arrived back in Umeå, Sweden, I knew exactly where I was. I had been in this city three times before, after all! Plus, because I had gotten on the early morning bus, there was still plenty of day left… and plenty of time to kill before I checked into my apartment at 2:00 PM the following day. After loading up on enough food and water to get me through the night, I cycled west out of town toward an area called Röbäck and then beyond it to a small forested area marked with a cave icon on my map. 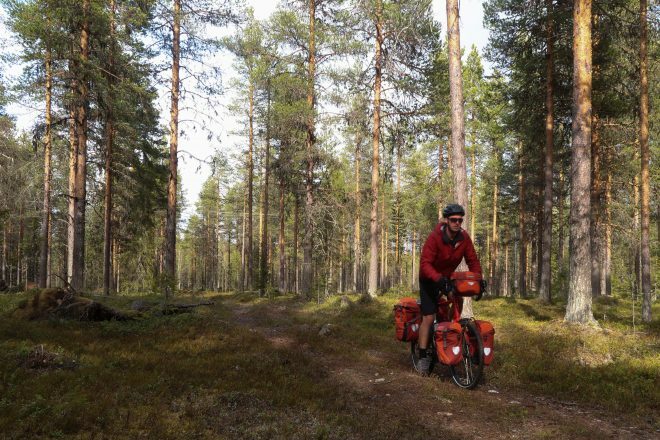 Cycling down a narrow single-track trail and frequently having to lift my heavy bicycle over fallen trees and up or down steep, rocky ledges, I eventually made my way to the Anna-Lotta kammaren (or the Anna-Lotta cave). This area is unique because it features an impressive rocky outcropping with a small cave (only really big enough to shelter about 12 people or so). There were several fire rings around the cave entrance where people had camped previously, so I pitched my tent near one of these pre-existing fire rings and made this my home for the evening. I had the entire cave and everything around it to myself! After pitching my tent, I spent a great deal of time walking around and exploring the area. There was so much to see and do here, I could have easily spent another hour or two walking around the cave. From the top of a rocky ledge, standing directly over the cave, I could see farmland and forests in the distance. Even though it was raining and the mosquitoes were out to play, it was an impressive place to be and a great way to end my bike tour to the Nordkapp and back. I slept in late the next morning and didn’t pack up my tent until nearly noon. 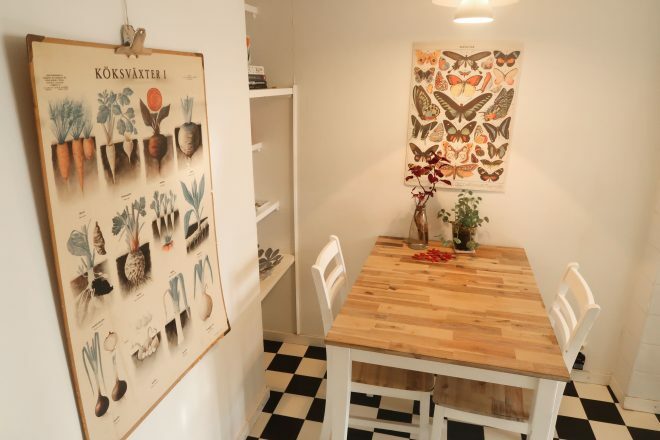 Then I cycled into the Umeå city center, changed into my cleanest pair of clothes at the bus station, then rode the short distance to my new apartment in the Haga district of Umeå. 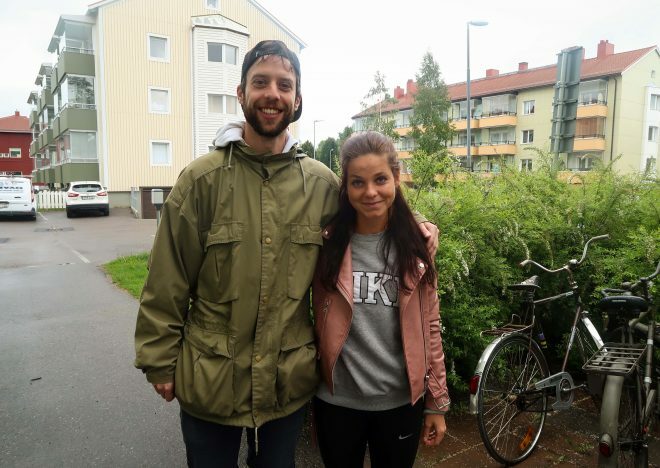 Once there, I was greeted by Hillevi and Arvid, the young couple whose apartment I would be renting for the next 40 days. Arvid and Hillevi showed me around, showed me where the laundry room was, showed me how the Internet worked, asked me to water their plants while they were gone, and then they said goodbye. 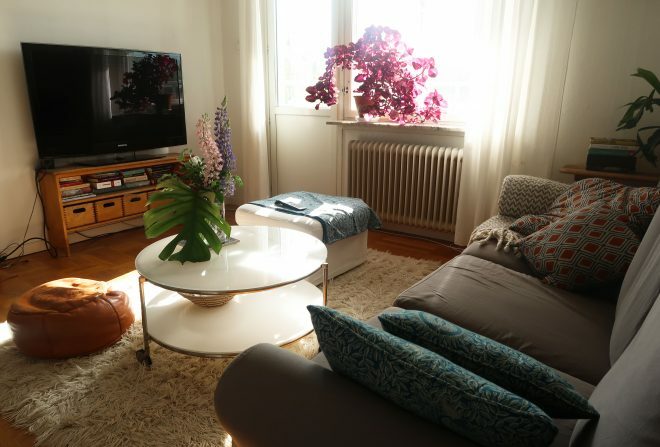 I was sad to see them go so quickly (and felt that we might be friends if I were to live here in Umeå full-time). But once they were gone, I was happy to have the apartment to myself… and to finally be able to take a shower! I had been on the road for 28 days and during that time I had only taken one real shower when I was in Alta, Norway. By the time I got back to Umeå, I was more than ready for a long, hot wash! 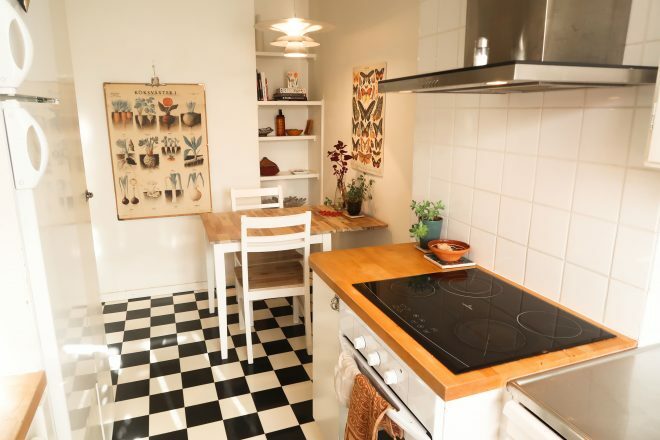 Here are some photos of the apartment I rented in Umeå, Sweden. Above and below are two different views of the living room. Check out that purple plant in the window! I love it. The kitchen is where I ended up spending most of my time. The table here turned out to be the perfect place to sit and work on my computer. 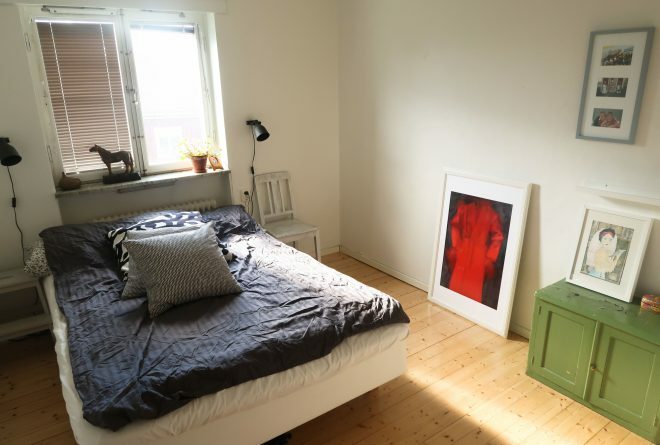 If you watched my video from my bike tour across Norway and Sweden in 2016, you might recognize this bedroom. This is the bedroom I got locked in last summer and had to call Arvid and Hillevi to come and help me get out. It was both a traumatizing and funny experience. This year, when I arrived at the apartment, Arvid made sure to point out that the lock had been completely removed from their bedroom door. Finally, my favorite part of this apartment is the small enclosed patio that’s accessible via a door in the living room. I would sit out here in the mornings and work on my computer while taking in the view and watching the clouds slowly soar past. 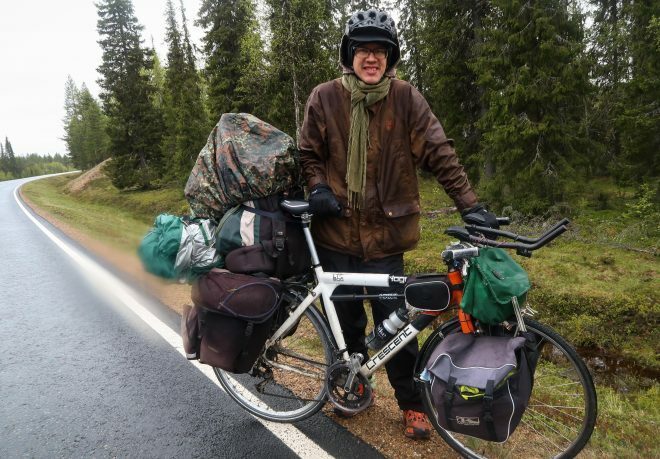 Overall, my bike tour from Umeå, Sweden to the Nordkapp in northern Norway was one of the best bicycle touring experiences I have had in my 17+ years of traveling by bike all around the world. Even though it was cold and wet at times, I enjoyed the ride because I was in nature, the roads were relatively traffic free, the people were extremely friendly, the food was good, I was able to do the entire bike tour for very little money ($722.76 USD total or $26 USD per day), and more than anything else, I was able to just get away and be on my own. I’ve bike across 9 different countries since being diagnosed with testicular cancer in late 2015 and having surgery to treat my condition. The physical recovery was a whole lot easier than I thought it would have been, but mentally recovering from the diagnosis has been extremely difficult. 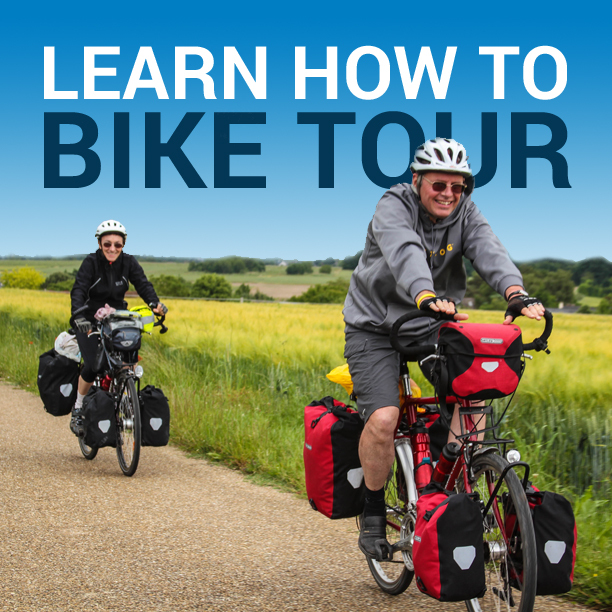 I think I struggled on my previous bike tours (in Ecuador and Colombia especially) because I was worried about my health and my head was simply not in the right place. But this bike tour in northern Europe gave me exactly what I needed. It got me into nature; it allowed me some time to simply sit and be with myself; and it distracted me from the negative thoughts that had been running through my mind for the previous one-and-a-half years since I was diagnosed with cancer. Ultimately, reaching the Nordkapp in northern Norway was not as memorable or as spectacular as you might think. 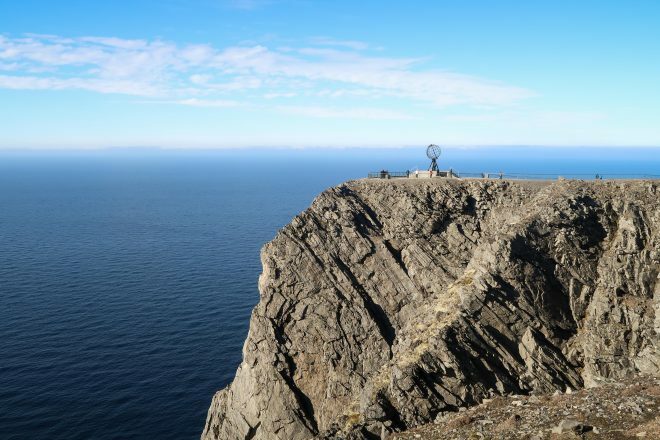 The Nordkapp itself is basically just a big rock with a metal globe on top of it, located above and endless blue sea. Of course, I knew that cycling to the North Cape was not really my goal on this bike tour. Getting to the North Cape was just a place to go… and the real highlight of the journey was everything that took place before getting there. 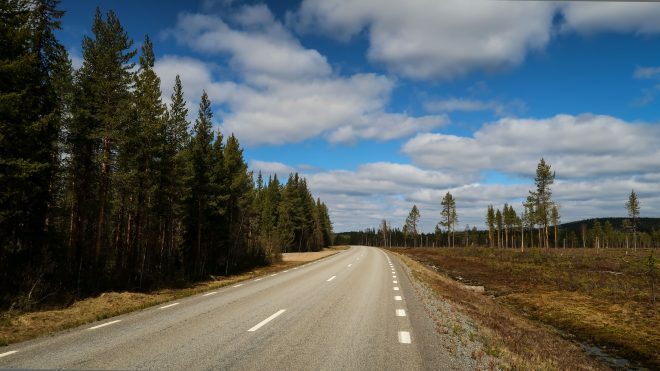 The journey was the memorable part – not the Nordkapp itself! 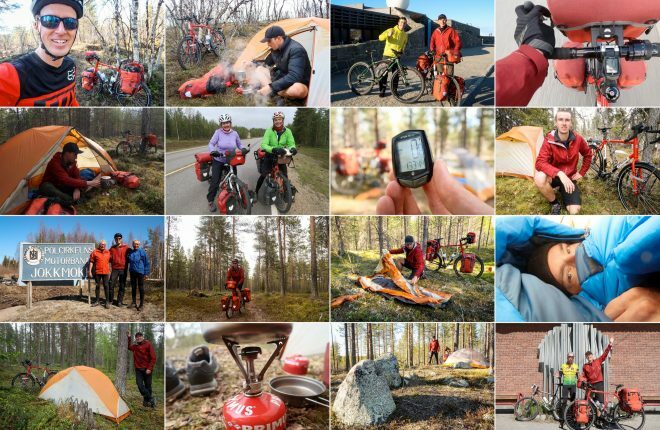 This entry was posted in Bicycle Touring Pro Articles, Darren Alff's Bike Tour Blog, Europe, Featured Articles, Finland, Main Articles, Main Featured Articles, Norway, Photos, Sweden, Uncategorized and tagged adventure cycling, alta, alta norway, bicycle touring, bicycle touring pro, bike touring, Camping, cycle touring, darren alff, finland, invalo, jokkmokk, nordic bike tour, nordic countries, nordkapp, north cape, north cape norway, northern norway, norway, sweden, umea, umea sweden, wild camping. Excellent stuff Darren! Looking forward in seeing video’s from this trip. I recently moved back from the Carribean (Curacao, next to Aruba) to the Netherlands. 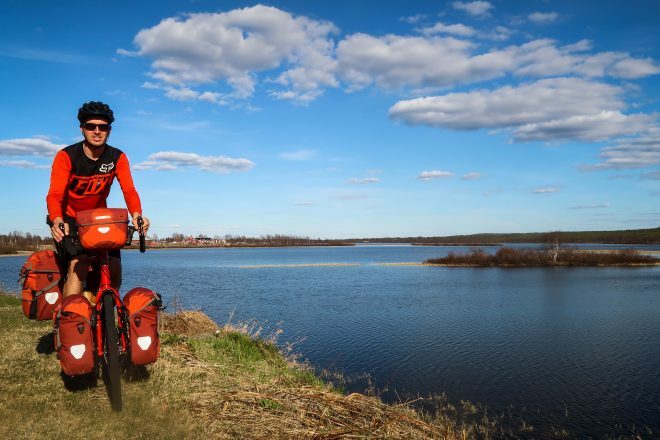 One of the reason is that is got hooked by you on bicycle touring and wanting to do just that. An island is very limited, haha. I this time I have a simple road bike and do long day trips so far. Looking into purchasing a touring bike soon. The plan is to ride for a week or so in late summer. Hope to see you out there sometime. What an amazing story, of your adventure! I spent my evening reading your latest story and getting so inspired! You’re really a good writer too, Darren! Thank you! I hope so we meet someday! That was one awesome ride Darren. So well written and simple. Felt like I was there with you throughout the trip. Such an exciting trip and your routine during the trip is so much better than most of us follow in our daily lives. I haven’t cycled in the past decade and I’ve been planning to get myself a cycle for commute to improve my fitness and also relive my childhood. I hope I’ll also be able to cycle like you and travel. So inexpensive too and nature friendly! Thanks again Darren. Take care. Well done Darren. That last tunnel before going to the Nordkapp, yes, I remember that thing very well. Just in the middle, at the lowest point, hanging from the ceiling…there are two giant fans, blowing dirty air out of the tunnel. These fans were at work the moment I came along……the noise was deafening. 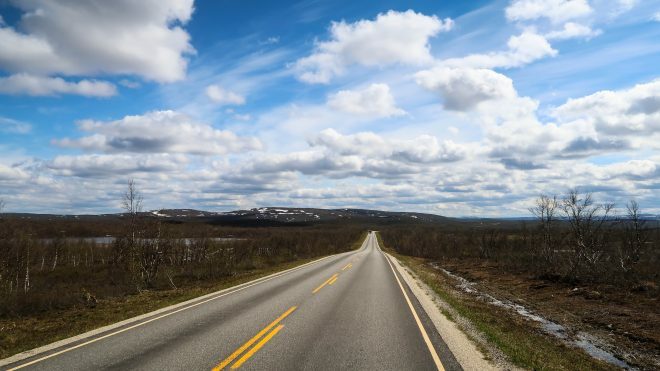 I had terrible weather from Kautokeino to Alta….but the rest of the route to the Nordkapp the weather was excellent. It’s 15 years ago now I made this trip. Unforgettable, and reading your blog….I think you’ll not forget this trip. You make touring look fun. I’m looking forward to experiencing it. Awesome report. I’m currently cycling roughly the same route through Kautokeino and your reports are very accurate. Very useful information for people who are interested in doing the same thing. Nice post. What I’ve been wondering for some time is why most of the tourists do not use dynamo hubs. One of the reasons is the price – I mean the expensive ones which do not affect so much the speed. However, and from personal experience, it is worth having one. I would say it is a much better option than using solar panel. But yes – the price is a determining factor. As a fan and regular follower on YouTube this is the first time that I have visited your website to read an article detailing one of your trips. 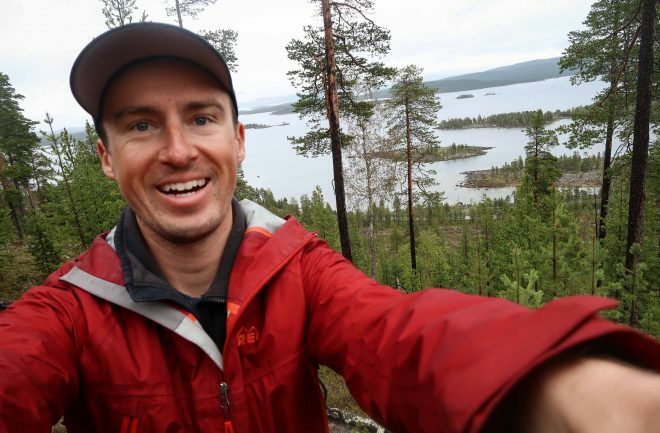 I was super impressed by this article for your ability to write in such an interesting and vivid way, it gives a rich account of the finer details and observations that you make along the way and massively compliments the videos of your tour from Umeå to Luleå. 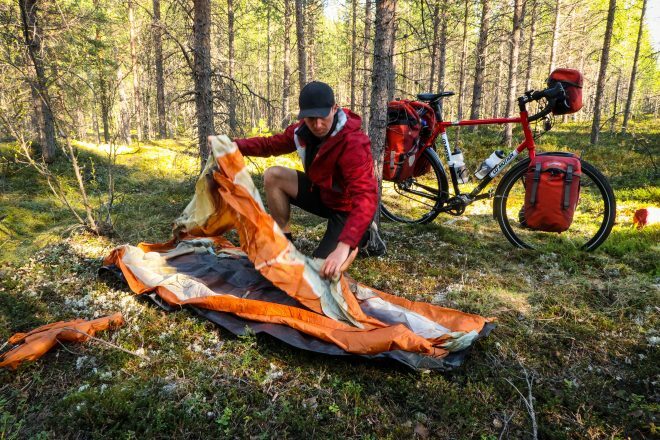 You demystify and remove all of the intimidating aspects of solo long distance bike touring which prevents people like myself from taking to the road. Thank you so much Darren!